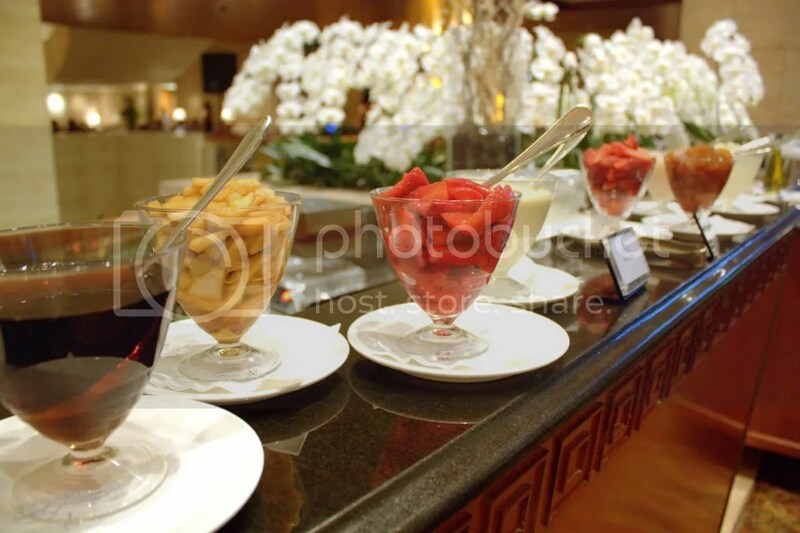 A hotpot buffet with 8 flavours each of Hagen Daz Ice Cream & Movenpick Ice Cream, Red Wine and Beer, do I have your attention yet? 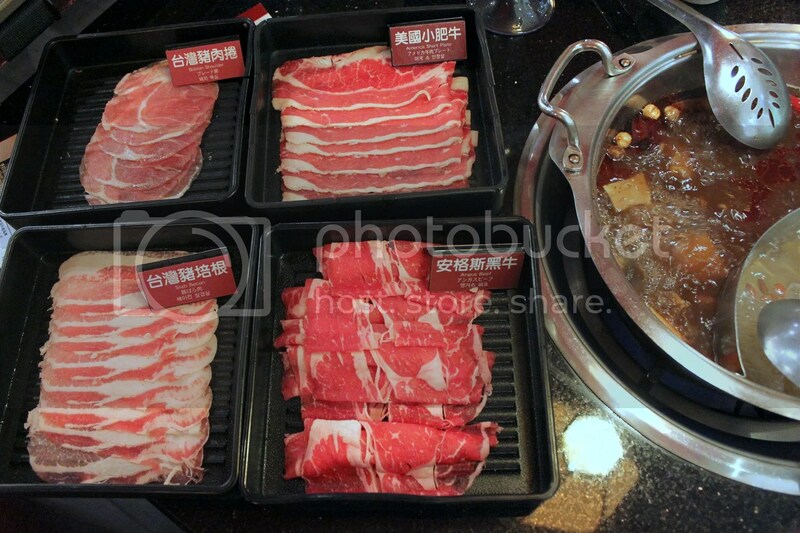 While Taiwan might be known for its scenic tourist spots like Tarako Gorge, Sun Moon Lake and the various hot springs, the highlight of my Taiwan trip turned out to be buffet hotpot restaurant 馬辣, much to my Taiwan friend E’s dismay who adamantly insisted that Taiwan has much more to offer than a mere hotpot restaurant. Anyhow, I first heard of 马辣 from my mum, and subsequently as a recommendation from an adjacent Taiwanese passenger on the flight to Taipei. It’s a pretty popular place usually packed to the brim during mealtimes, with 5 outlets currently in operation in Taipei that are all very much accessible by public transport. Our first visit left us so impressed (and lazy to search for other alternatives), that we decided to come back to celebrate T’s birthday here as well. The buffet is priced at 498NT++ for weekday lunches and 598NT++ for weekends/dinners (or roughly S$25++), for a time limit of two hours. However, the staff seemed pretty lax on this policy and allowed us to stay on for more dessert, drinks and idle chatter since there was no one else in the queue then. 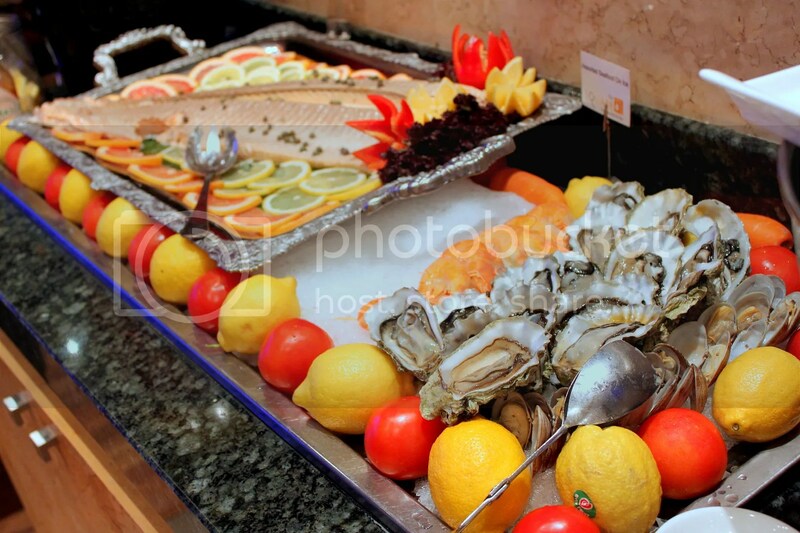 Buffet items include a host of meats (Angus beef, Boston Pork Should, Chicken Thigh…), Seafood (Oysters, Scallops, Prawn, Crab…), Vegetables, Dipping Sauces, Drinks(Fruit Juices, Soft Drinks, Beers, Floral Teas…), Desserts (Cakes, Fruits, Ice Cream…). Diners are also allowed to bring their own booze with no additional corkage charge, overall a pretty good deal if you ask me. Heck, I would pay that price for just the free flow ice cream and beer. 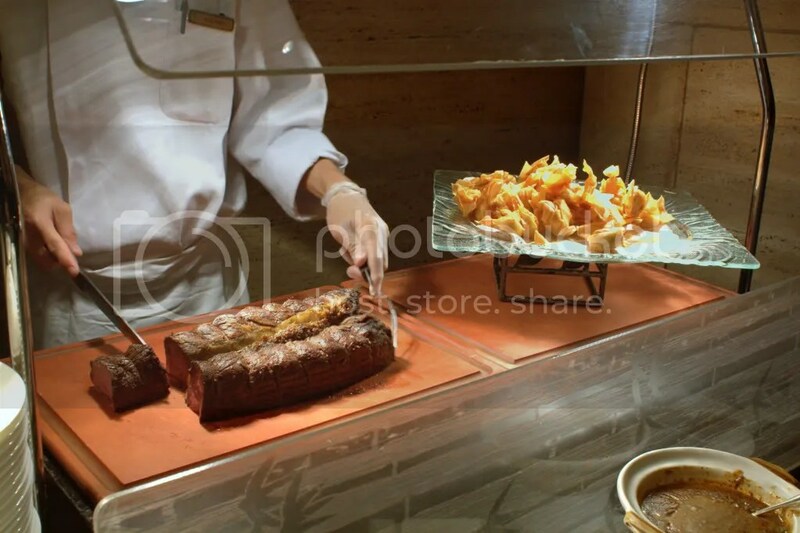 With the exception of the dipping sauces, drinks and desserts which are self-service, other items require diners to physically tick a checkbox and pass it on to the wait staff, who will then have the indicated items brought to your table, ensuring that whatever arrives is relatively fresh and not left in the open for prolonged periods of time. 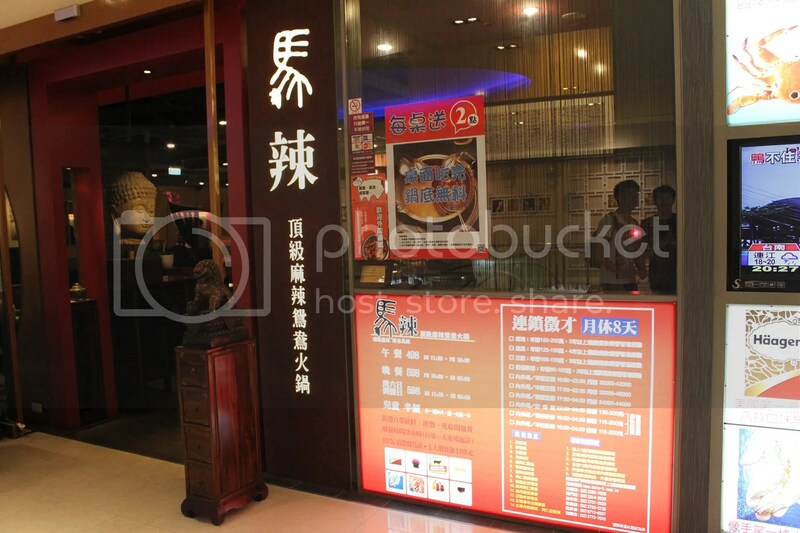 So to cut long story short, 馬辣 is an incredibly value for money hotpot buffet if you are in Taipei that I would definitely recommend visiting. Following its popularity since its debut in December 2013, Stellar @ 1-Altitude has decided to continue hosting its Wine Lust Sunday Brunches into 2014. This is pleasant news because from what I have seen so far, they seem to be doing it right. 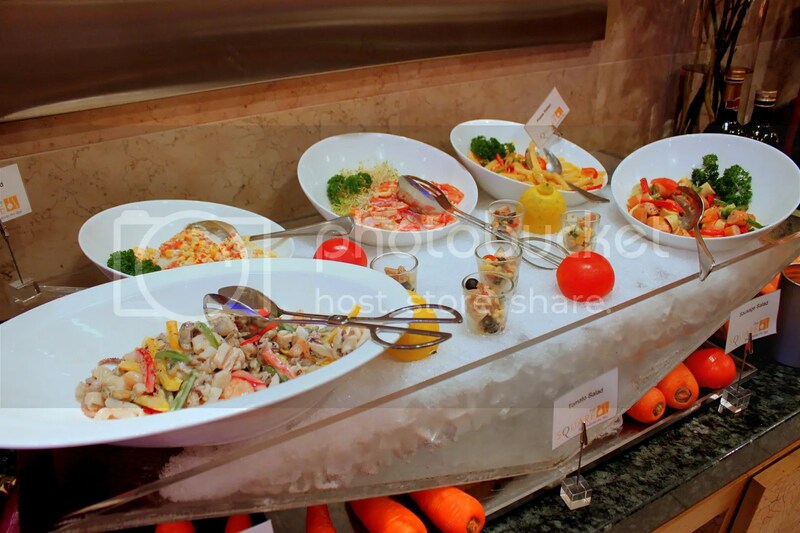 The brunch buffet features a good mix of International cuisines, ranging from Japanese Sushi, a meat carving station, cold cuts, western brunch items and most importantly, a free flow of red/white/sparking wine. 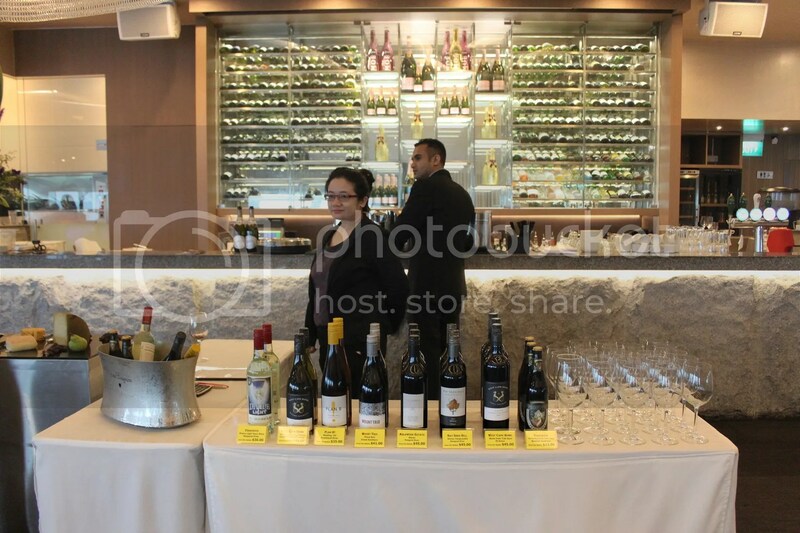 Adding to that, wine aficionados will also be glad to know that a tasting table of up to 10 wines (different from those on free-flow) will also be set up by a different wine supplier each week, allowing for wine tastings and bottle sales during the course of the brunch. And if you didn’t already know, at 62 floors above ground level, the view from Stellar is simply breathtaking too. 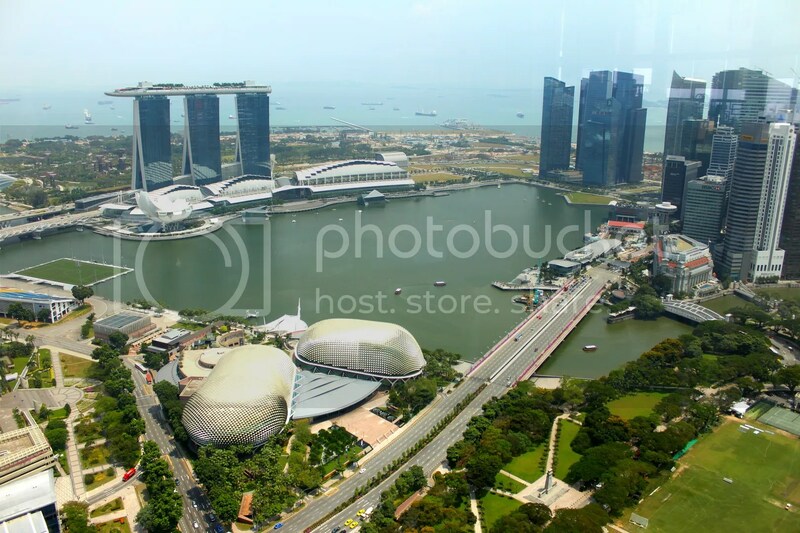 How many restaurants can actually boost looking down towards Ku De Ta @ Marina Bay Sands? 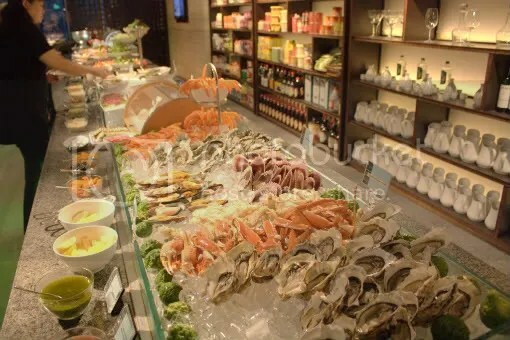 At $110++ per pax, Wine Lust is competitively priced against other Sunday alcoholic brunch buffets such as The Line @ Shangri-La Hotel ($138++), Equinox @ Swissotel ($148++) and Clifford @ Fullerton Bay Hotel ($148++). Two reasons might explain this price discount. Firstly, Wine Lust does not offer Champagne but personally, a good non-Champagne sparkling wine offers equal, if not higher utility. 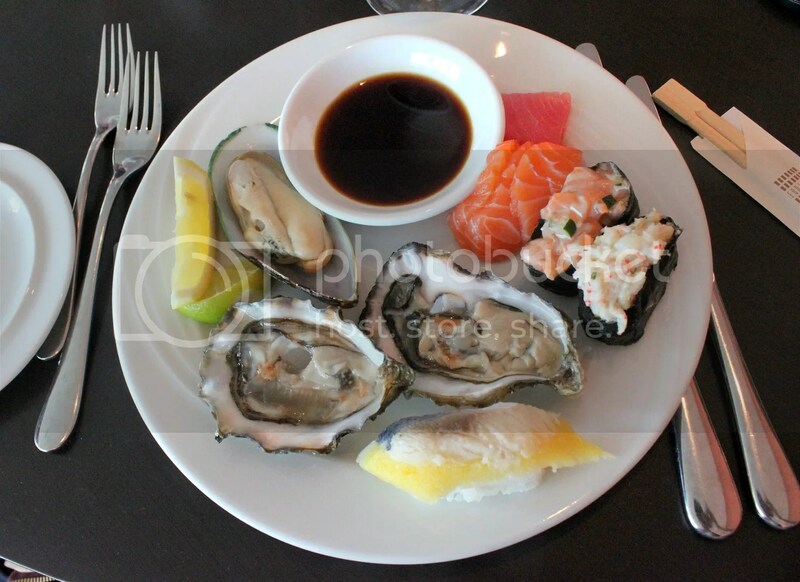 Secondly, Wine Lust offers less variety in menu options, doing away with the ubiquitous raw seafood lineup. 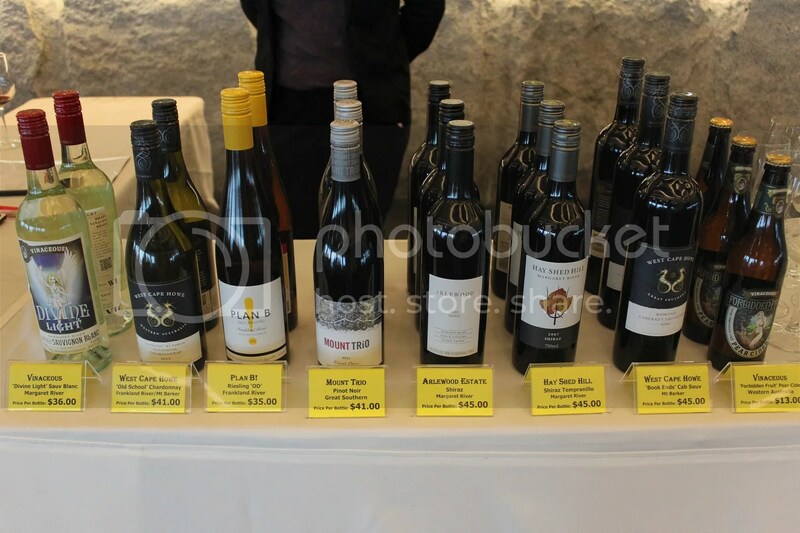 What Wine Lust offers however, is something unique and what I find to be the key differentiating factor going for it; a larger proportion of live cooking stations and made to order items. Do not make the fatal mistake of underestimating the menu. While the entire list of food items is categorically displayed on a single page, by the end of the meal, it is likely that you will still end up having trouble standing up, as the individual items listed can become pretty substantial when summed and secondly, since many of the items are made to order, the quality and taste follows that of ala carte and you will likely finish up the entire serving because wasting good food is a sin. 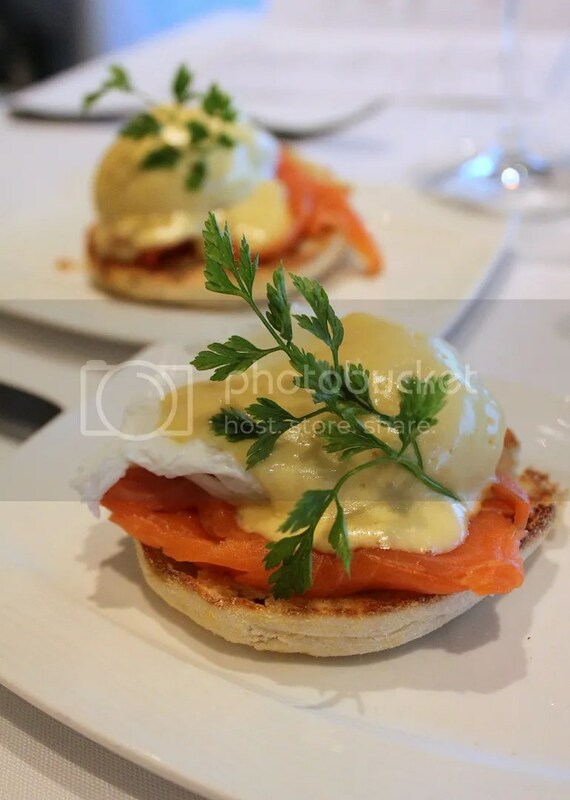 One of the items I found particularly good was the made to order Salmon Benedict. The saltiness of the smoked salmon was controlled and perfect for my tastes. The poached yolk was flowy and the hollandaise as rich and creamy as it gets. 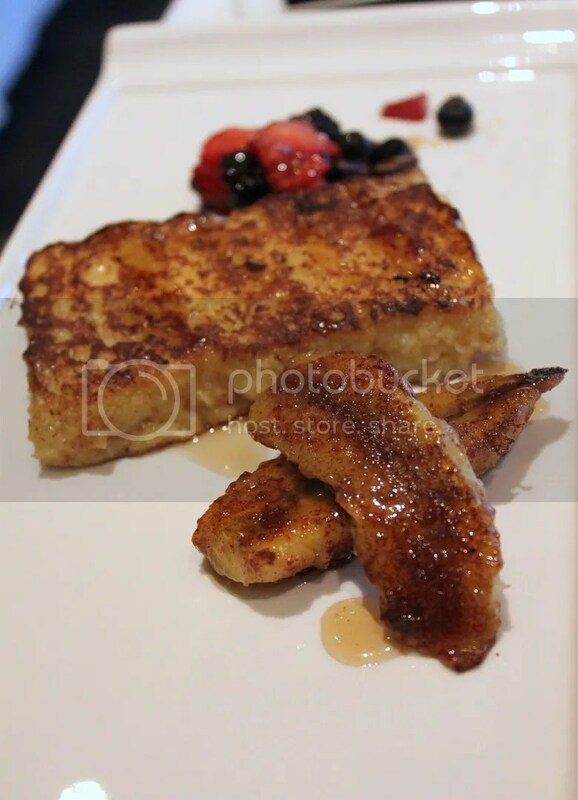 Another brunch item worth getting is the French Toast with Caramelized Bananas. It might potentially be one of the best renditions you ever laid your taste buds on with its crisp exterior and airy interior that doesn’t fill you up too badly. 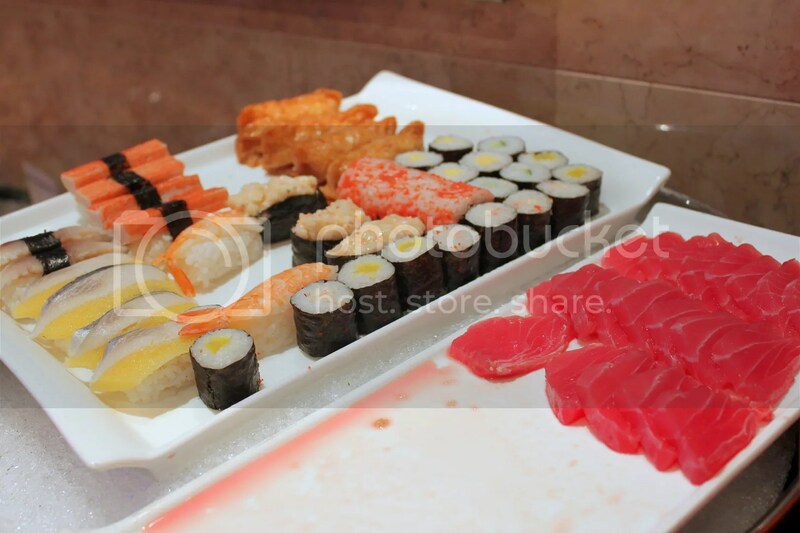 I had no complaints with the Sushi section either and found it quite a few notches higher than the usual hotel buffet, possibly because the sushi is made in small batches to ensure that the stock of sushi displayed is always fresh. 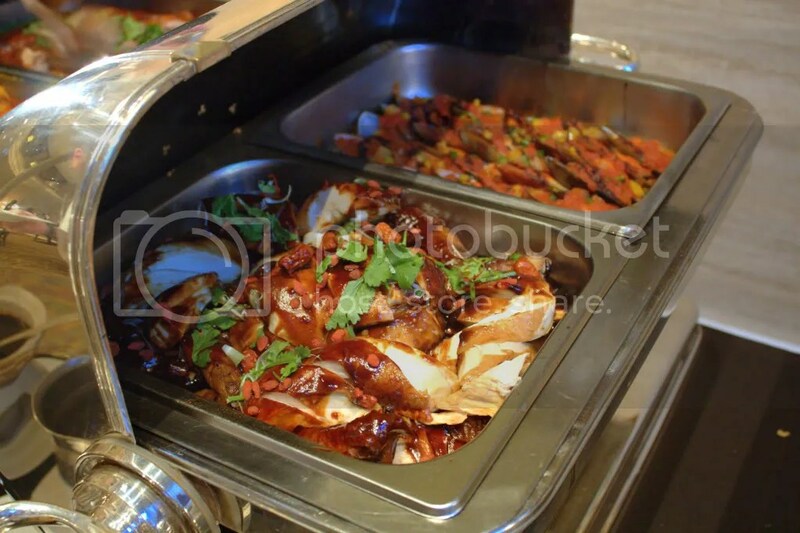 One of the highlights of the buffet was the Claypot Chicken Rice. Just like how they do it in traditional dim sum restaurants where you see the staff pushing a cart of fresh dim sum up and down the restaurant for diners to order, the same thing is done with the Claypot Chicken Rice here, where it is pushed around on a trolley whenever a fresh batch is made. 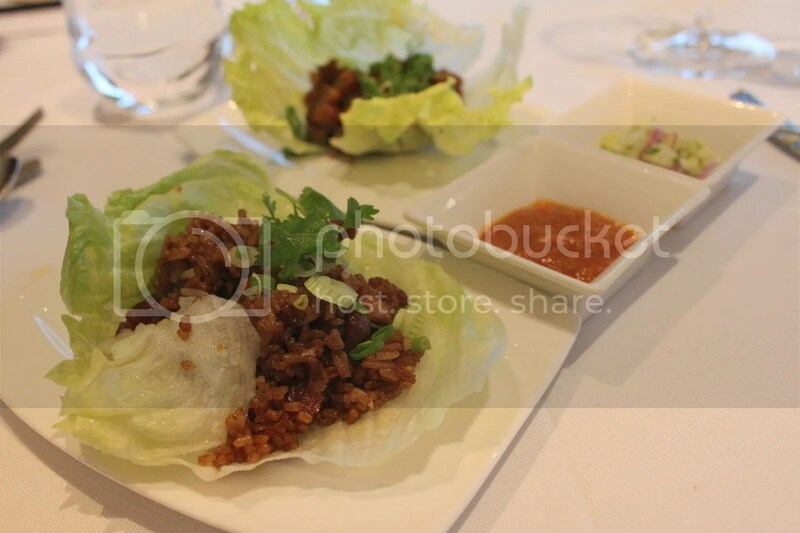 To give it a little twist, the rice is served in a piece of lettuce with Tomato Belacan and Cucumber Relish on the side. I was advised to pair it with the Sauvignon Blanc and man did it make a difference. The Claypot Rice tasted a whole lot more fragrant with a hint of sweetness that I did not get in the absence of the white wine. 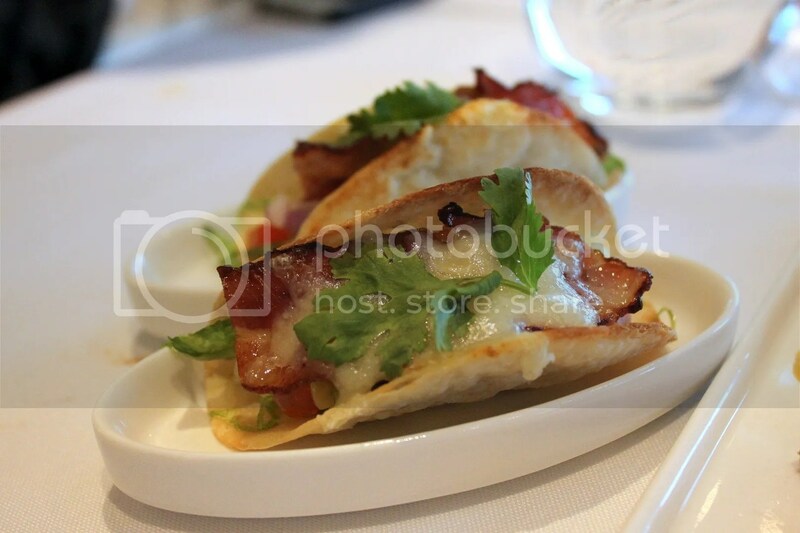 The mini tacos were also made to order, so they arrived crisp but both CJ and myself found it a little too sourish from the sauce used. 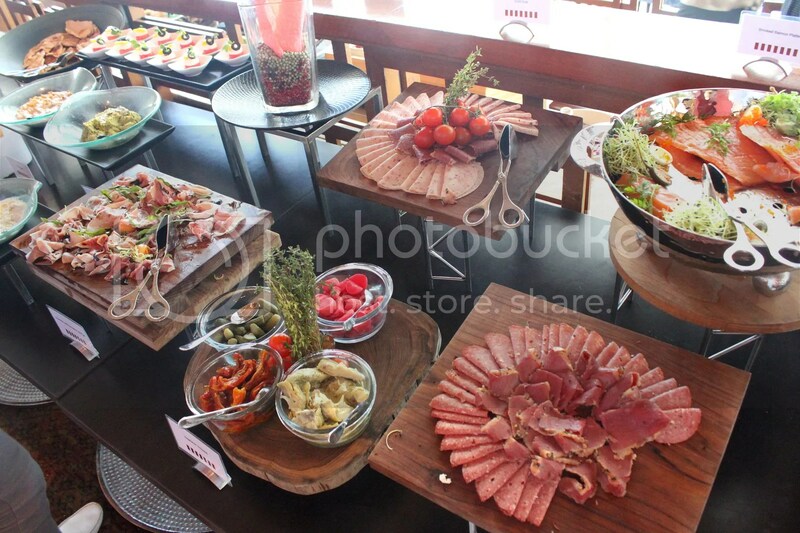 The biggest disappointment for the brunch was the carving station. 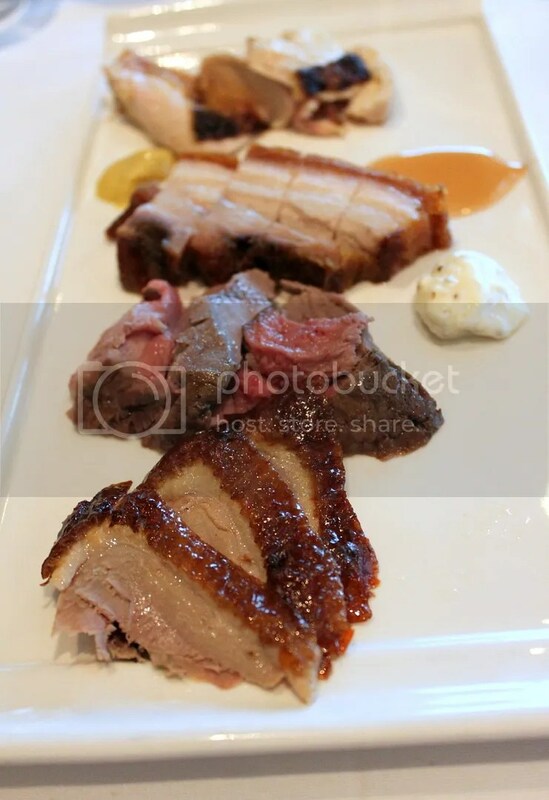 While the meats (Spatchcock Chicken aka Roast Chicken, Roasted Pork Belly, Rosemary Roast Lamb Leg, Roast Duck) scored high aesthetically with the meats and duck skin glistening from the lighting, they were awfully dry and lacked flavor. 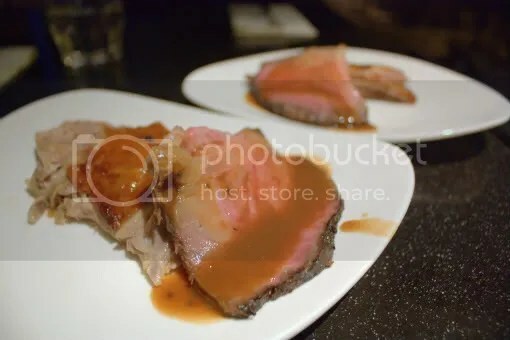 Hopes that the made to order Wagyu Rump would redeem the meat section were quickly dashed as I found the beef extremely sinewy and difficult to cut. 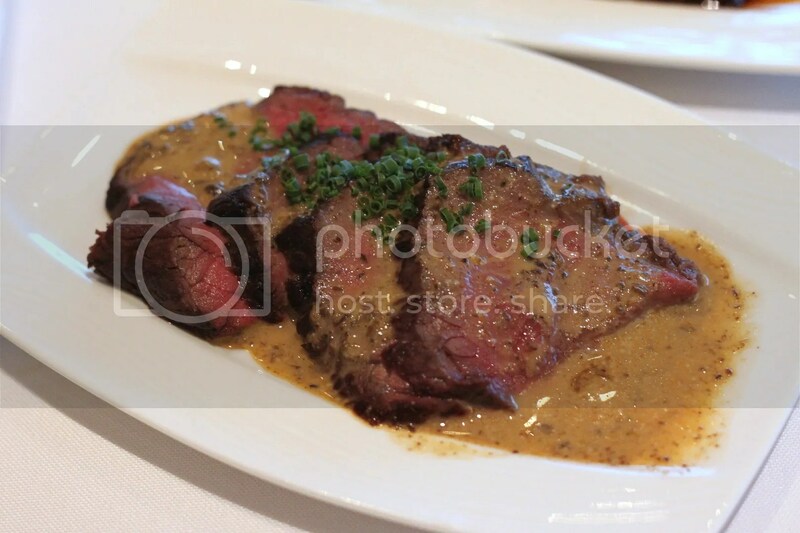 Of the two options of sauces (mushroom or red wine), I much preferred the red wine sauce since it complemented the beef way better than the bland mushroom sauce. 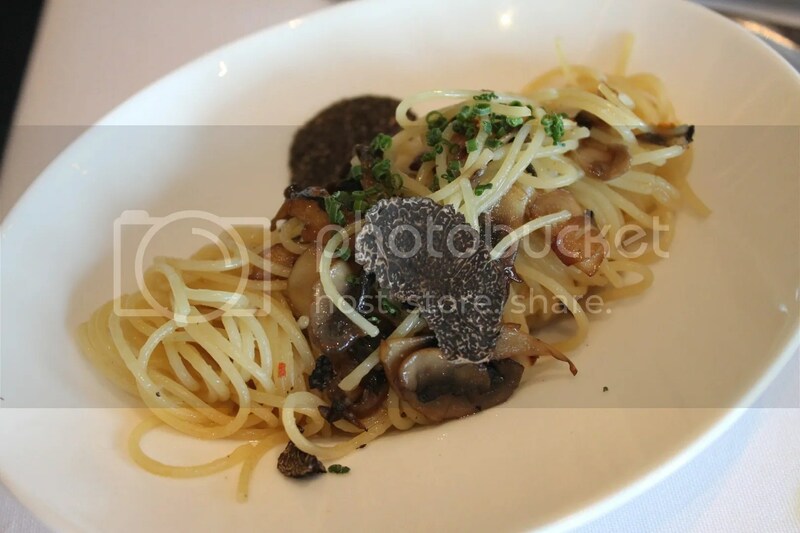 Pastas are also made to order, with the option of Carbonara and Aglio Olio. 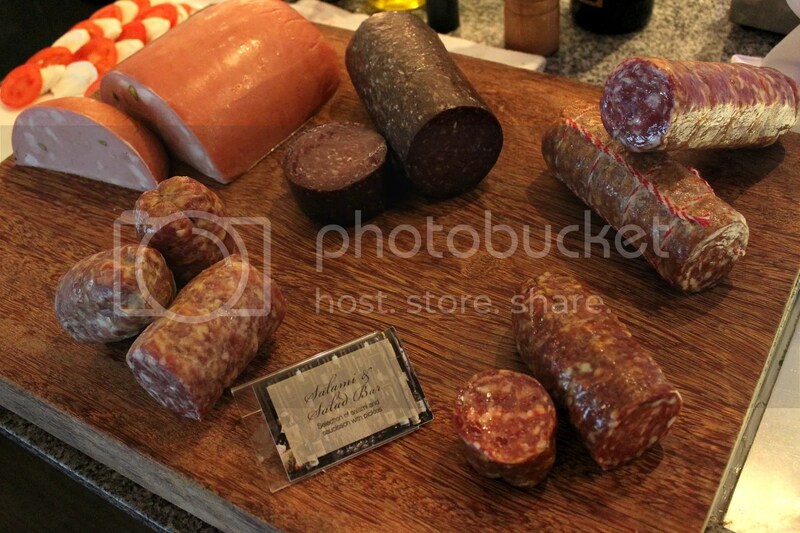 We chose to share the latter since we were pretty stuffed and found it pretty mediocre. Would have loved a stronger garlic flavor and more olive oil, since it came across as a little dry. That said, I was pretty surprised when the chef came over and asked if we would like to have truffle shavings with our pasta, which may cost in the range of $10-$20 per gram in local restaurants. No points for guessing our answer nor our enthusiasm. 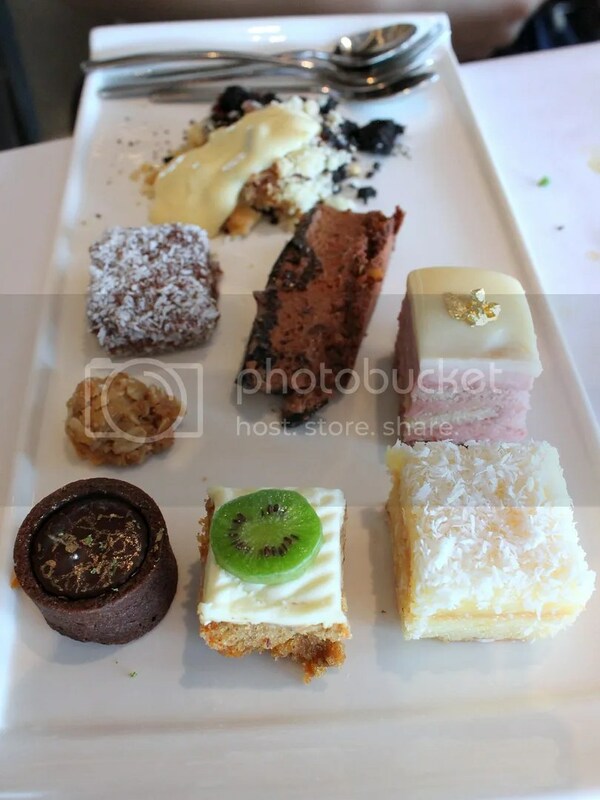 The dessert lineup was decent as well, featuring Lamingtons Drive (a type of sponge cake dipped in chocolate and rolled over coconut), Lemon Coconut Cake, Orange Carrot Cake, Chocolate Tartlets, Hazelnut Praline Cake, White Chocolate Raspberry Cake, Strawberry Crumble and Anzac Cookies (an oat cookie). My favourites were the Strawberry Crumble, which is served warm and the Hazelnut Praline Cake (which looks like a chocolate cake in the middle of the dish). 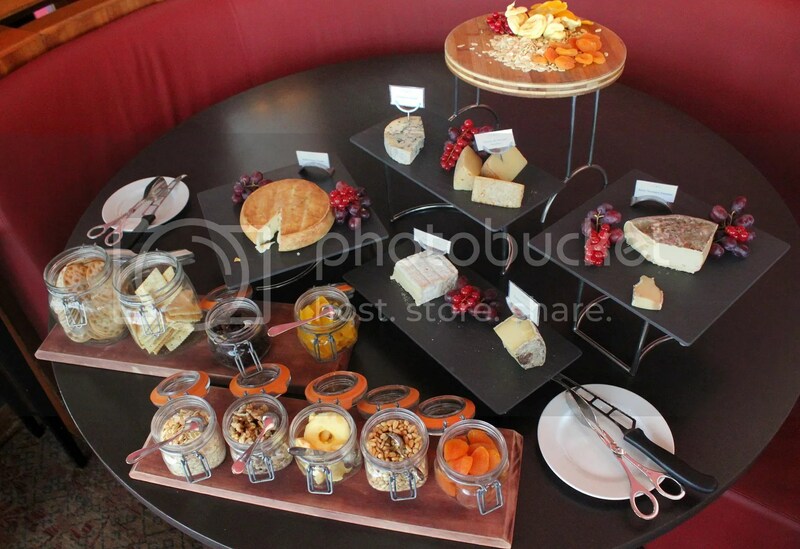 No wine brunch is complete without a cheese platter. Special thanks to Shasi and Stellar @ 1-Altitude for the invitation. It’s Restaurant Week again and as usual, I went into a rabid booking frenzy when seats were released. It’s not like I have the time to eat 4 Restaurant Week meals but guess I’m still a true blue Singaporean at heart, scared to lose out when there’s a queue. 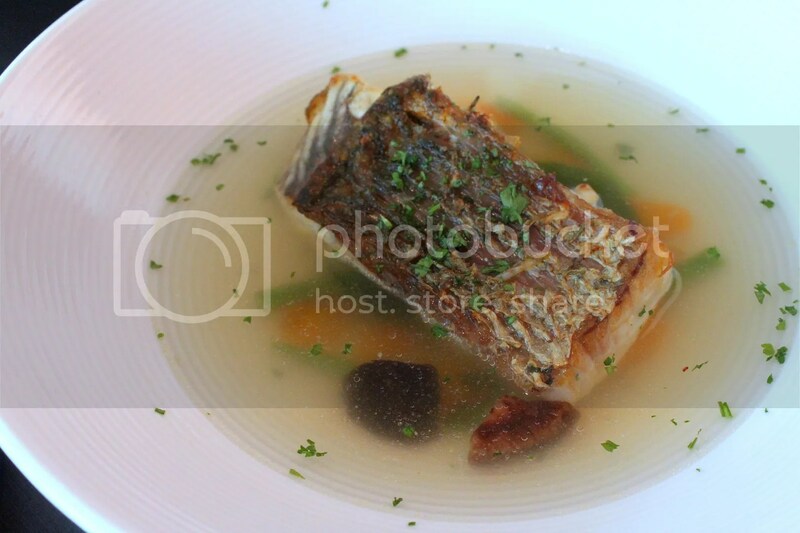 So while I had rather hard-to-get reservations at Basilico, Brasserie les Savuers and Keystone Restaurant over the course of the week, I had to drop them all, leaving me with just a sole lunch date at the highly acclaimed Equinox @ Swissotel. Just a bit of advice from me. While the goal of Restaurant Week is to allow would-be diners to sample restaurants’ offerings at more affordable prices, not all restaurant week menus are value for money, so it pays to do some basic research first. For example during the Oct 2012 installment of restaurant week, I actually noted a restaurant that charged $40++ for their restaurant week lunch menu, which was just a truncated version of their normal set lunch menu, meaning diners had to pay more for less choices of appetizers, mains and desserts! Thankfully, that same restaurant isn’t guilty of that this time around (but that’s because they increased the price of their normal set lunch). Equinox is probably one of the more value for money restaurant participants for restaurant week as the restaurant week menu ($40++) doesn’t deviate much from their usual set lunch ($59++). 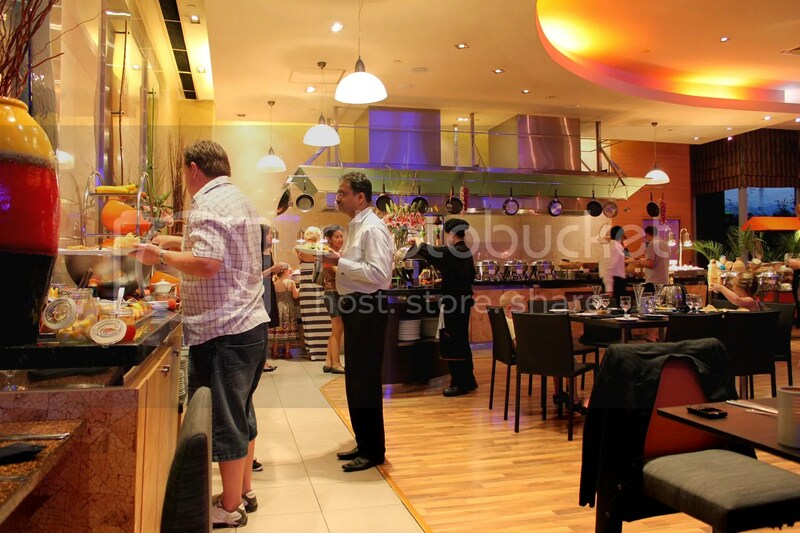 Their lunch menu comes in the form of a semi-buffet, meaning that appetizers and desserts are buffet style while diners can order 1 main (from 3 choices) off the menu. 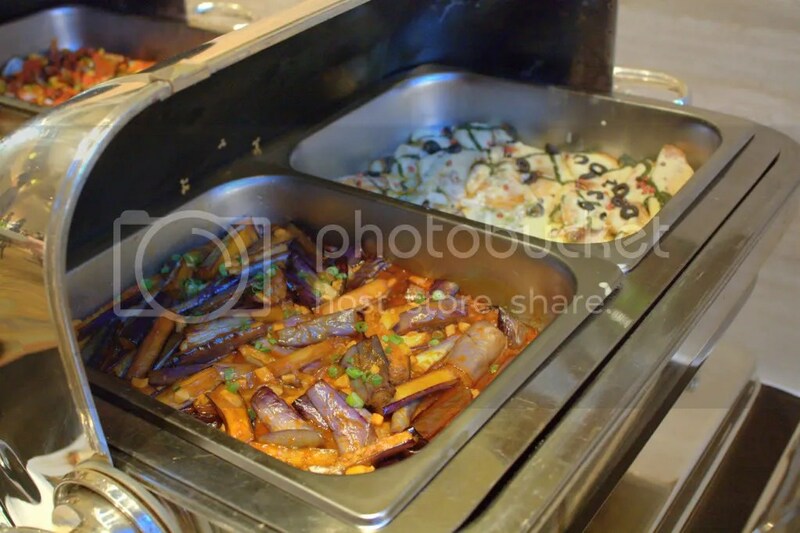 Given that my expectations of the buffet was along the lines of a salad bar in Pizza Hut (I do exaggerate sometimes), I was pleasantly surprised by the spread. There were appetizers like Shrimp Cocktail, Cold cuts, Proscuitto, Mediterranean dips like Hummus and Baba Ganoush, Smoked Salmon, Roast Duck Salad, Chilled Seafood (Fresh Oysters, Chilled Crabs, Clams, Mussels & Prawns), Sashimi (Salmon & Tuna), Assorted Sushi (featuring interesting ones like Hokkigai aka Surf Clam Sushi and Herring Sashimi) and unlike some buffets where the food is left in the open for long periods of time, I noticed that food refills here were carried out fairly regularly which is a good sign. 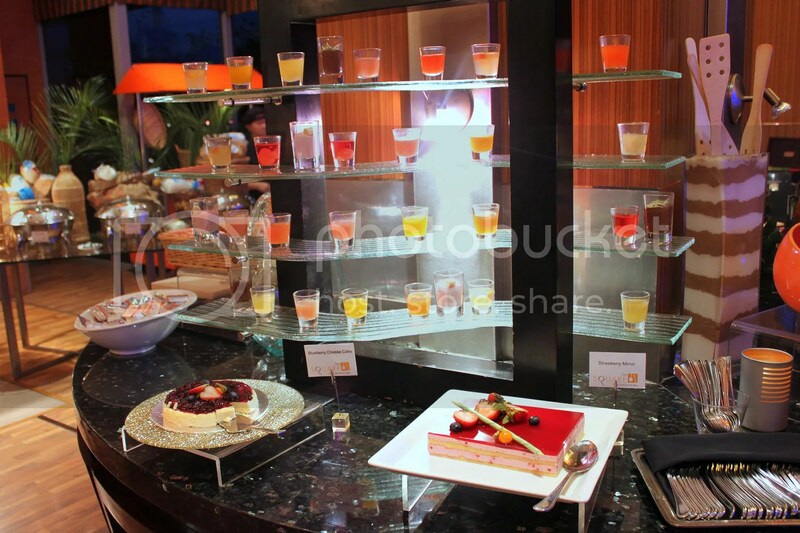 The dessert and cheese line was pretty decent too. 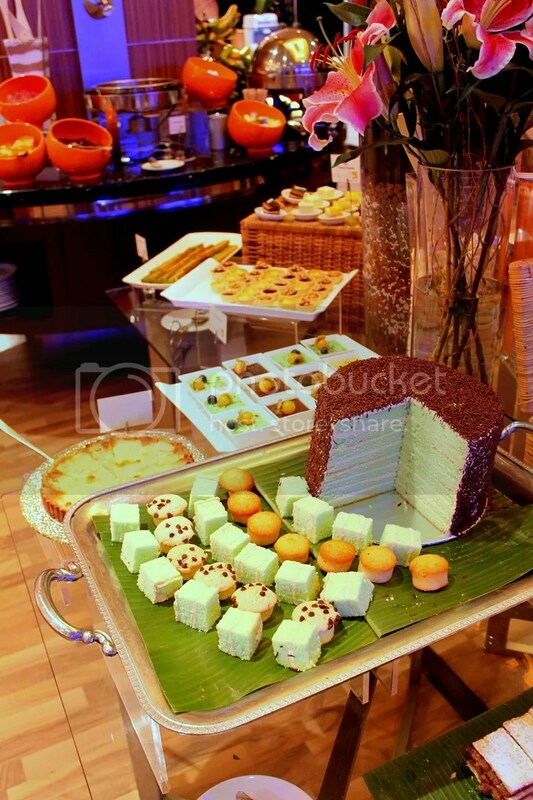 Apart from an assortment of cakes, there’s also the chocolate fondue fountain and Ice Cream! The sushi with bright yellow roe at the bottom of the plate is a Herring Sashimi, something not so commonly found at buffets. M liked the Watermelon with Feta (plated on the small saucer below) so much that she took 5 servings of it. 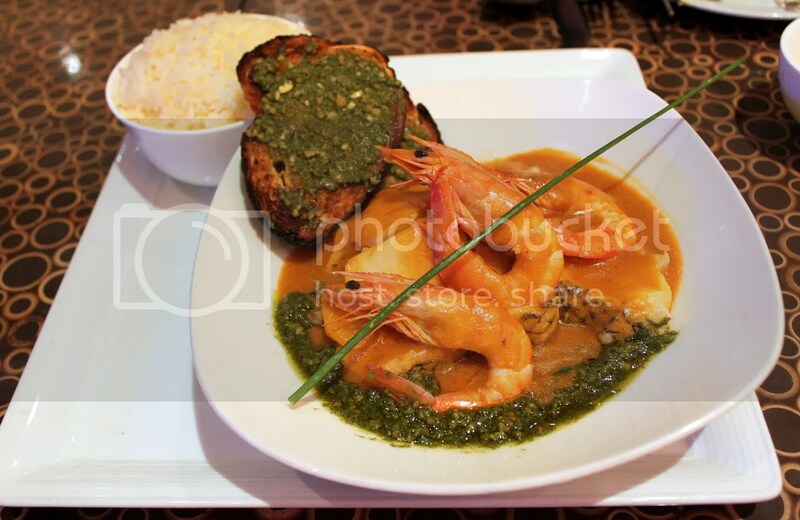 There were 3 choices of mains available from the restaurant week lunch menu. 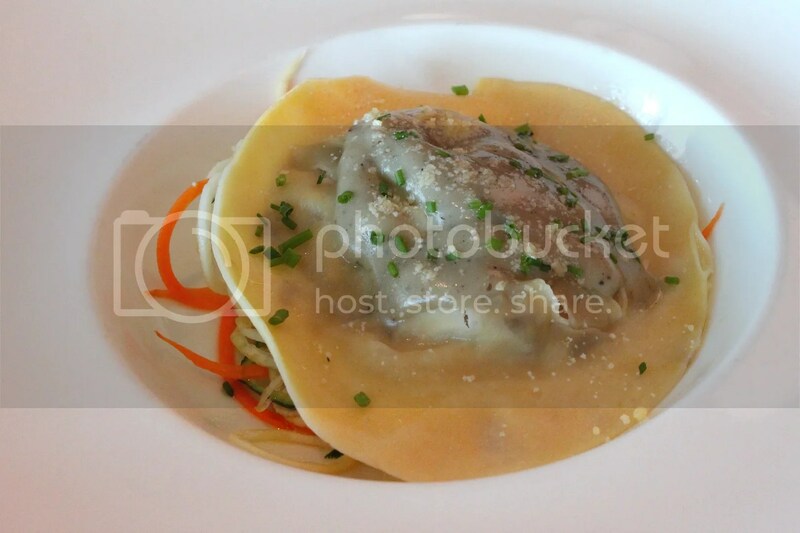 M got the vegetarian option of Wild Mushroom Raviolo with Vegetable Linguine & Mushroom Dressing. Raviolo is simply an oversized Ravioli and this one was filled almost entirely with Mushrooms that tasted excruciatingly sour from the excessive use of vinegar. The faux linguine made from grated vegetables didn’t help alleviate much of M’s suffering either. I didn’t try the Pan-seared Barramundi with Sauteed Green Beans, Shitake Mushrooms & Herb Broth but G didn’t have any complaints about it. 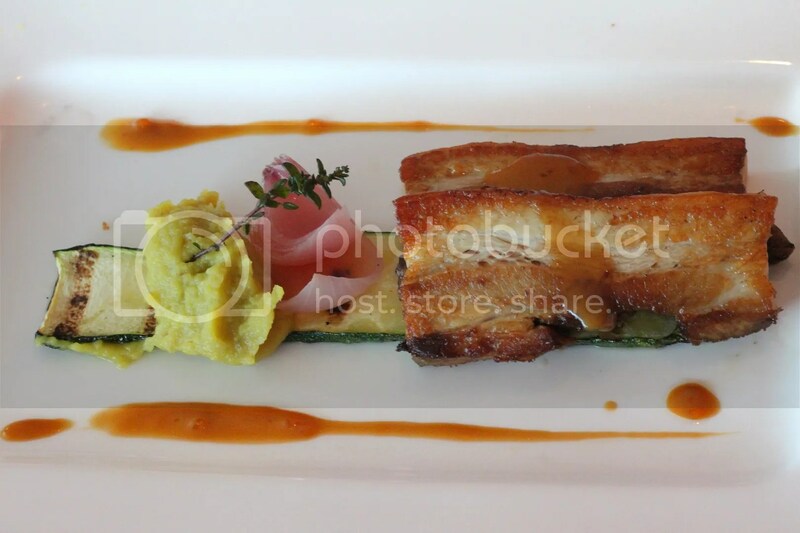 For myself, the choice of main was a simple one, the Slow Roasted Pork Belly with Curried Sweet Potato, Roast Onion & Zucchini in Cider Sauce. It was the most unhealthy dish I could find on the menu and going by my assumption of equivalent exchange, this would prove to be the most tasty dish. While it’s probably the best imo of the 3 mains available, it fails to impress, falling short by quite a bit relative to some of the Roasted Pork Bellies I have had. The meat wasn’t as tender as expected and slightly on the dry side. Didn’t favour the mash either since it was more chunky than smooth and the curry flavour didn’t complement the pork well. 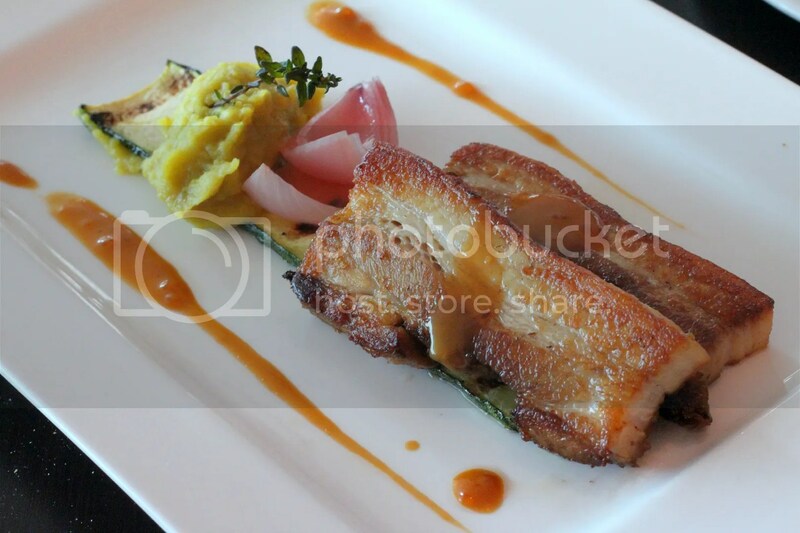 For good roasted pork bellies, try Skyve Elementary Bistro & Bar (which does it sous vide style) or Ember Restaurant (my favourite place for set lunch). 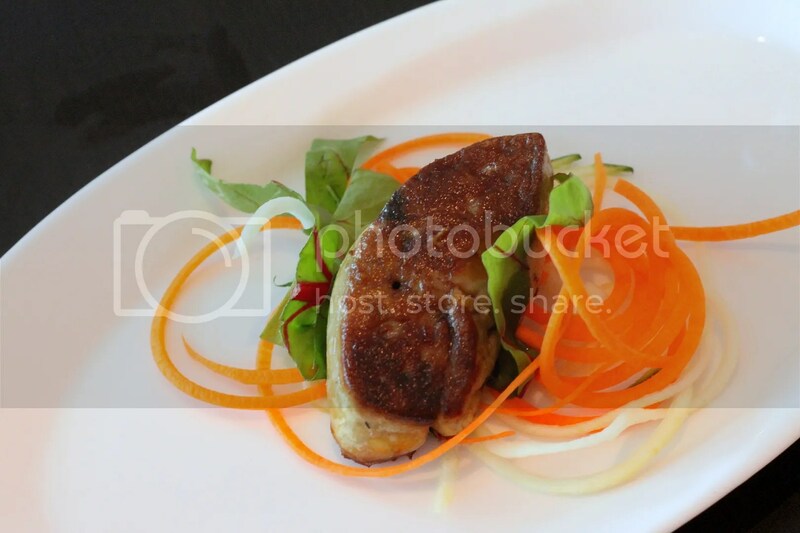 Just for restaurant week, diners can also opt to add on a Pan-seared Foie Gras for an additional $10, which I did. It didn’t turn out too well though as it was unsalted (intentionally as I clarified later) and overcooked, which saddened me a little especially since it was M’s first time trying Foie Gras and I always believed that your first time is supposed to be special. Shall bring her to somewhere with decent foie gras next time to atone for this atrocity. 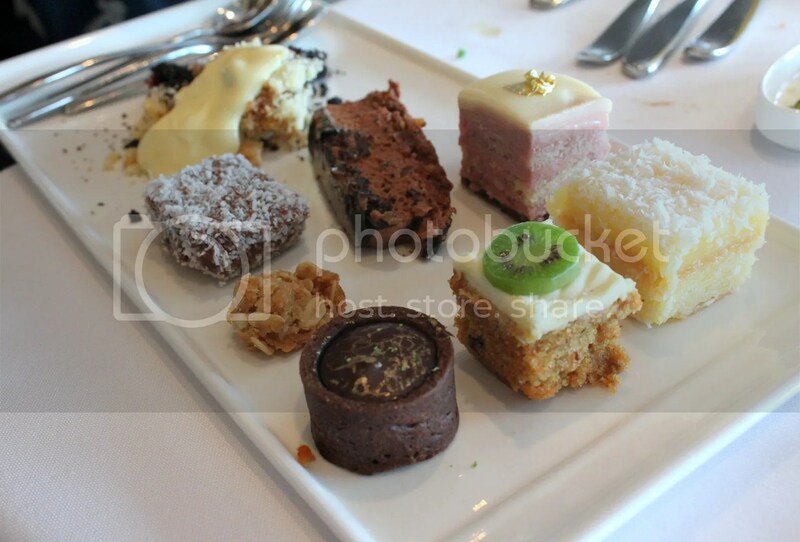 Sadly the pretty desserts didn’t taste as good as they looked. The more palatable ones include the Creme Brulee and the light Ivory Dome White Chocolate Cake. 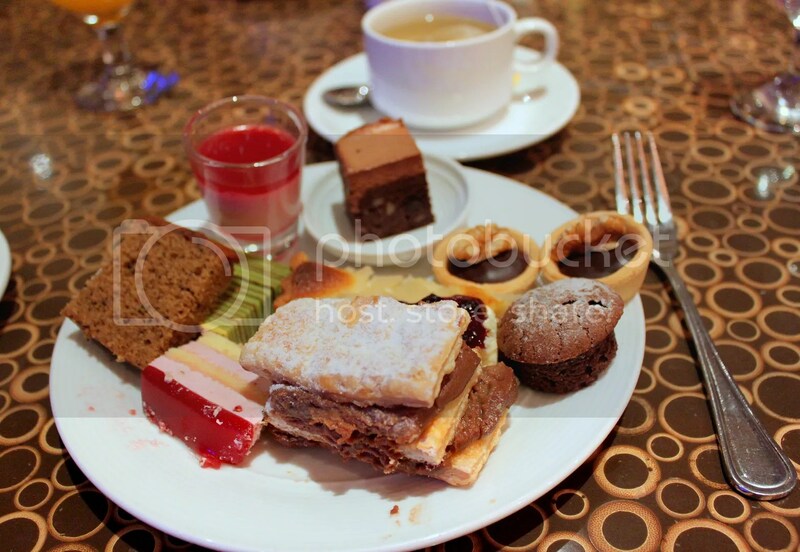 Coffee/tea is included within the set lunch and Equinox uses TWG tea in case you are wondering. I guess word on the street is right. 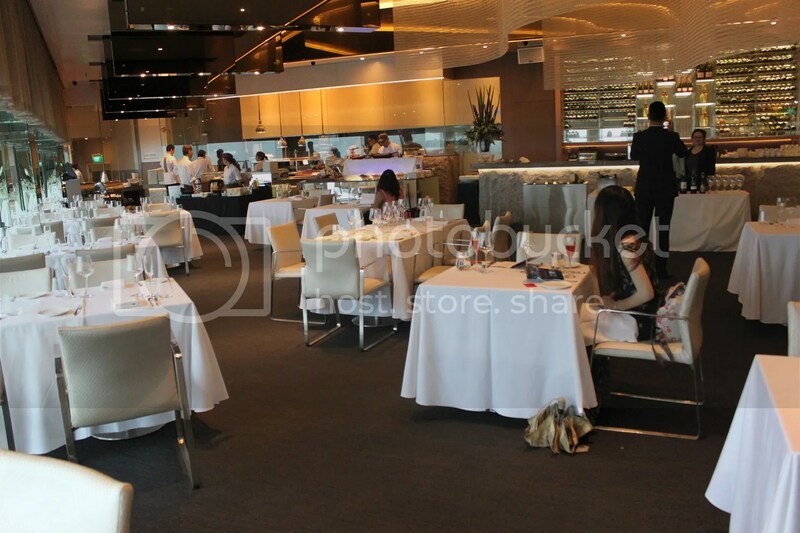 Food doesn’t seem to be the main draw of Equinox. The experience of dining 70 floors up with a panoramic view of the Marina area however, is another story. Categories : All YumYums in my TumTum, Asian, Buffet, City Hall, Cuisine Type YumYums, French, Location of YumYum, Western, Yummy! It’s currently university holidays now so I’m interning at a private equity firm for 10 weeks and I’m currently in my 6th week now. I would say that the firm I am at is quite unconventional. While most private equity firms function with a high degree of corporate culture (since most of the partners and founders of such firms tend to come from an investment banking or consultancy background), the firm I’m at is pretty “creative”. 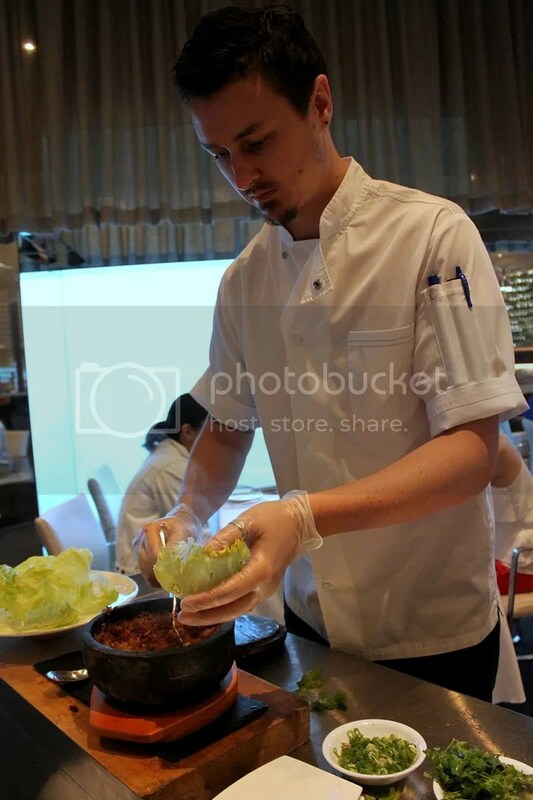 I go to work in casual attire (tho a polo-t with jeans is the minimum I would tread) unless I have have a nice restaurant dinner scheduled that night (I hypothesize that service staff tend to treat me better in working attire than when I’m in casual attire). There’s a drum set, guitar, keyboard and amps in the meeting room where my colleagues sometimes jam (everyone is musically gifted except me), and sometimes we project youtube using the projector, where my colleagues will play to the beat and I will just sing along. I will be traveling with my colleagues to Korea in July for 5 days (which intern gets to travel overseas during their internship?!) so I’m quite excited as well, and since the trip falls on the last week of my internship, I’m considering extending my stay over there to travel around Korea a bit more since the last time I was there was a decade ago. After that, I will be heading down to Hong Kong, Macau and Hainan Island for a long relaxing 11 day trip till end July before I start school in mid-August. 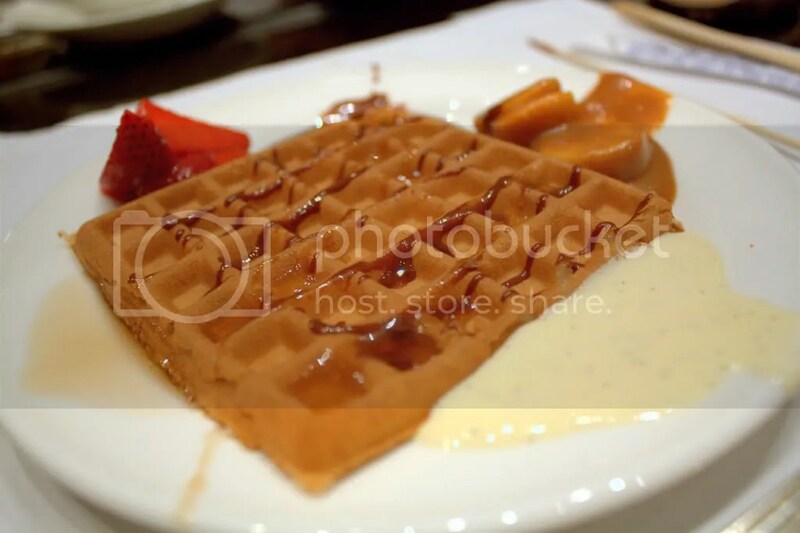 Anyway, I visited The Square on 2 separate tastings as coincidentally, a tasting was also extended to SMU Gourmet Club (that I’m a part of) and I went a second time on behalf of the club, playing the role of the meal photographer, so I guess I have a pretty good idea of what’s good here. 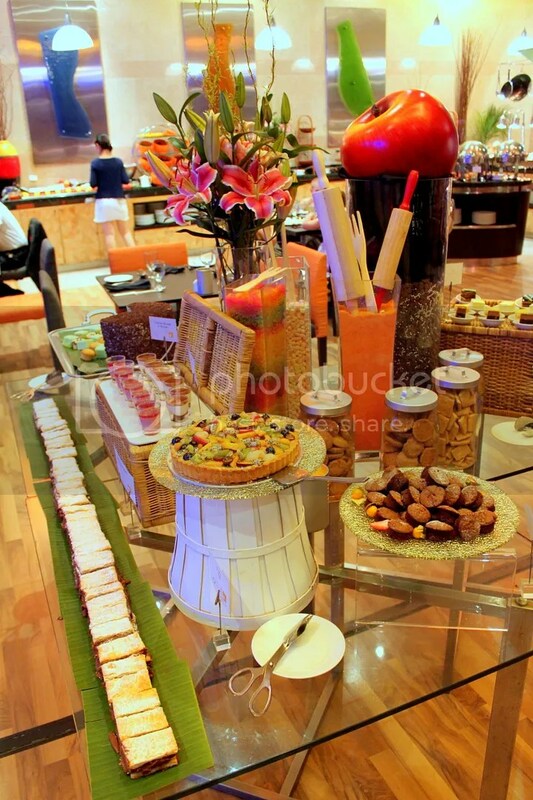 The buffet is priced at $38++ for Lunch (Everyday), $48++ for Dinner (Sun-Thurs) and $58++ for Dinner (BBQ nite, Fri-Sat). 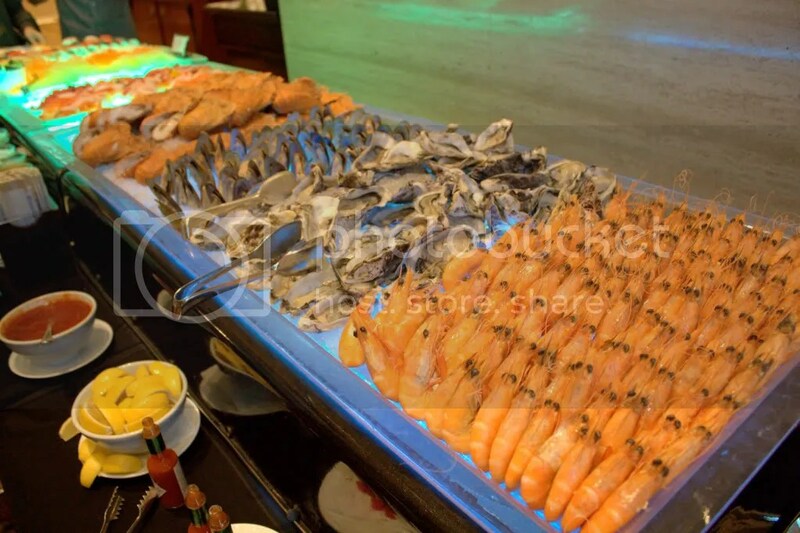 Unlike The Line from Shangri la, Carousel at Royal Plaza on Scotts or Triple Three from Meritus Mandarin, admittedly The Square @ Novotel Clarke Quay isn’t very well known for their buffet and most of the patrons here are hotel guests. 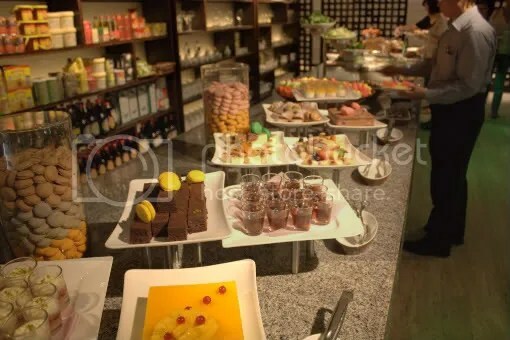 But with newly appointed Head Chef Jean-Philippe Couturier at the helm, has the buffet spread at The Square been rejuvenated? I’m not a buffet person per-se. 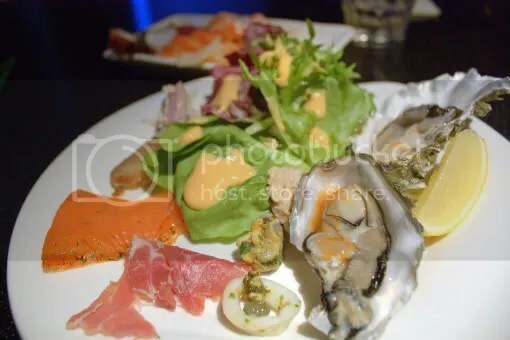 I used to be when I was younger, when the appeal of having free-flow sashimi was still there but now, the elements of authenticity and having freshly prepared dishes seems to take precedence so I have been slowing moving away from buffets. 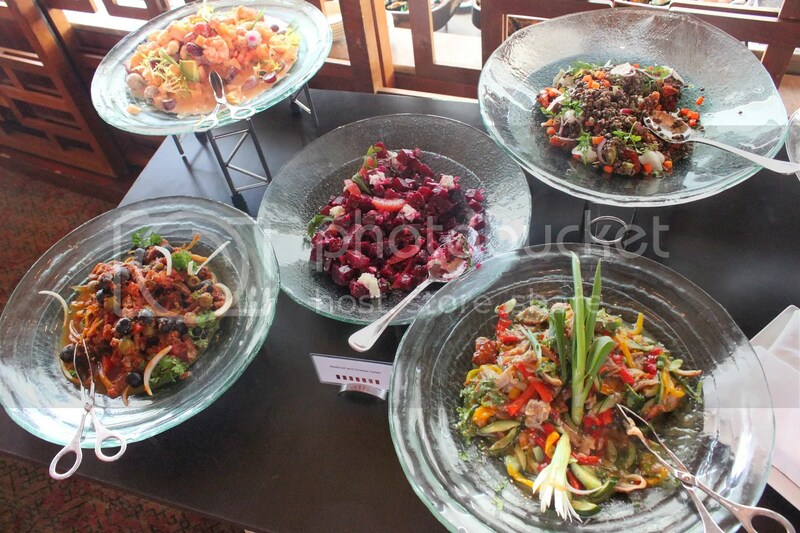 As such, dishes that I find decent here are in my mind, really laudable for buffet standards. Currently, they are having the What’s the BIG Deal? 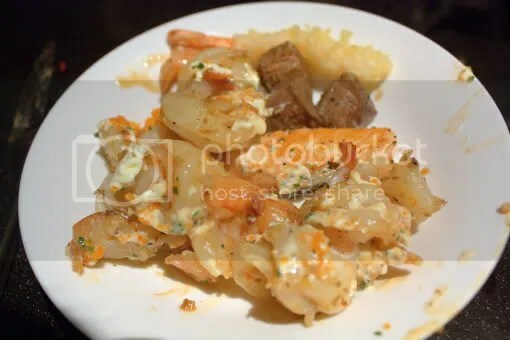 promotion, where 3-4 BIG dishes are featured every night during dinner such as a variety of risottos cooked a la minute. This promotion lasts till the end of June. They also have an upcoming Father’s Day Special every weekend, where fathers get to dine for free with every 4 dining persons. 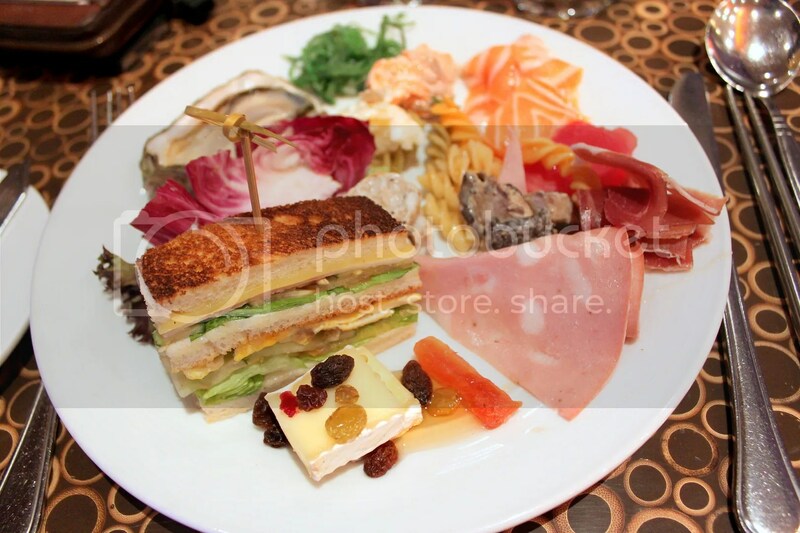 On the buffet line, there’s a selection of appetizers to choose from, such as assorted sushi, salmon and tuna sashimi, potato and pasta salad, oysters, chilled prawns & shellfish, brie cheese, club sandwiches, seaweed, golden coin bak kua, ham and parma ham just to name a few. 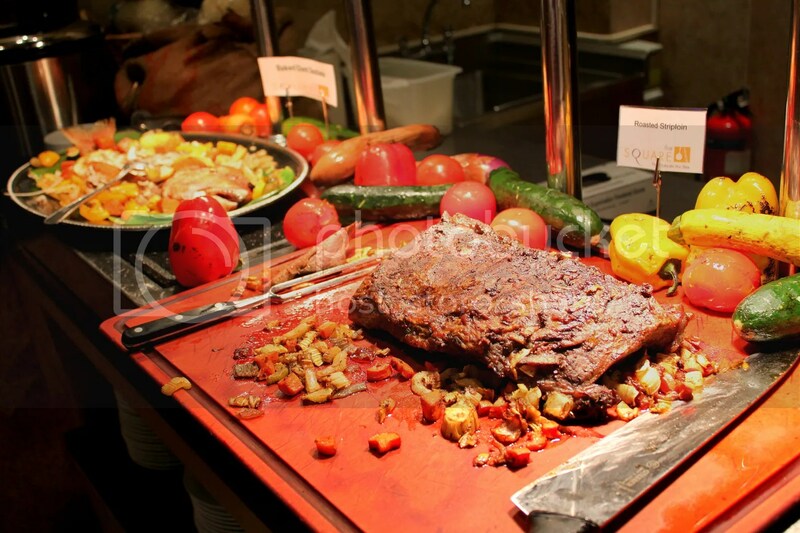 The Roast Beef at the carving station is pretty good but it requires diners to carve it themselves. Although the intention might have been good, to ensure that the beef does not dry up when left in the open for too long, few people actually take the effort to carve the meat themselves and end up missing out on this splendid roast. As mentioned above, some of the “big dishes” will be prepared a la minute, with the risottos being one of them. 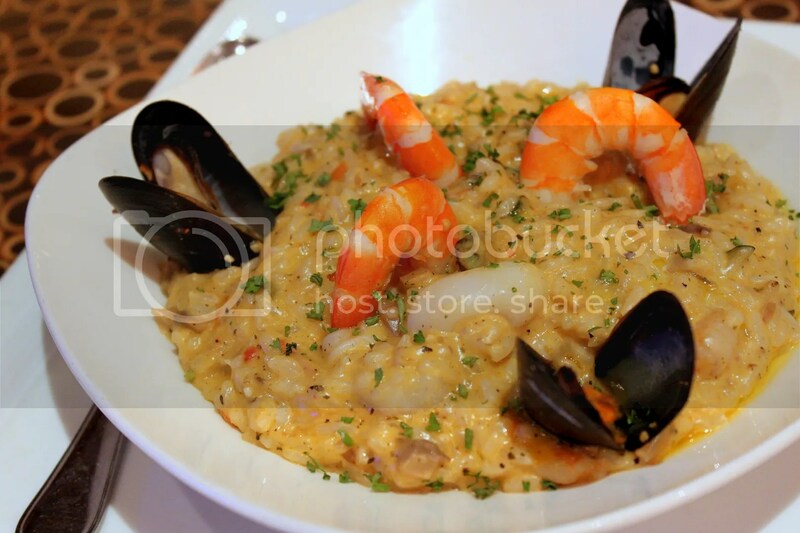 On my first visit, I tucked into the Seafood Risotto which I found rather pedestrian. If only there was a pure-scallop risotto (I’m sure they can whip it up), scallops are my favourite! 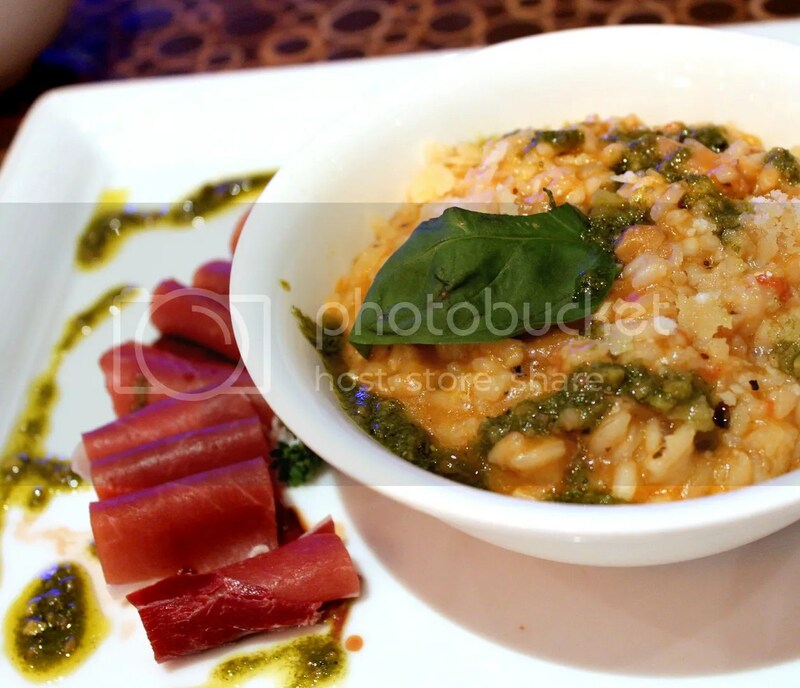 However, on my second visit, I received a Vegetable Risotto which came with a side of Parma Ham. I thought this was much better executed than the seafood risotto and something I might consider ordering again. 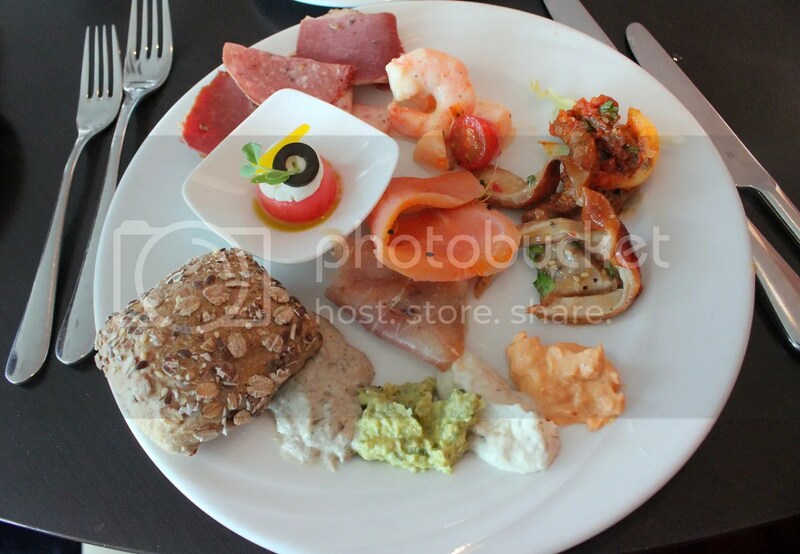 The cheesiness was balanced well with the the hint of tomatoes puree and basil pesto and if the parma ham served with the risotto isn’t enough, just head down to the buffet line to get a refill. Ironically, my favourite main here is only available from the ala carte menu, the Poached Cod Fillet in Spicy Coconut and Prawn Broth, served with Sauteed Vegetables and Chicken Rice ($34++). 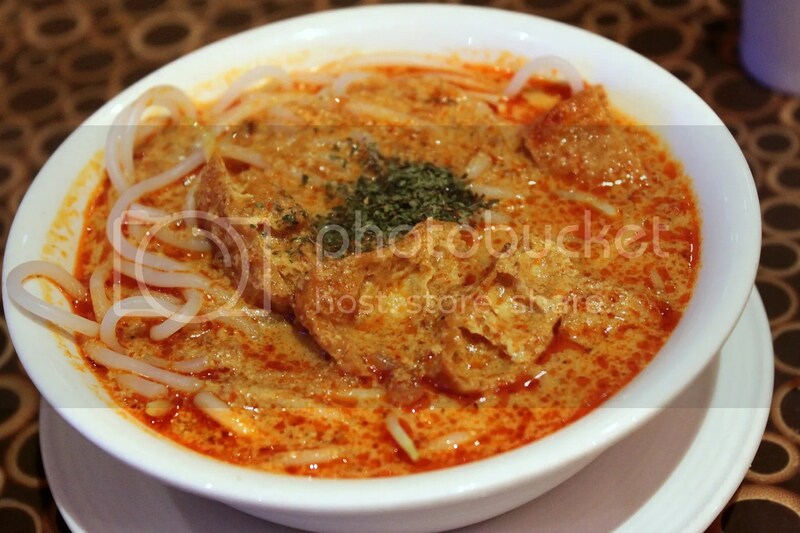 The gravy tastes like a creamy sweet laksa sauce with a little more concentration and richness than the usual laksa gravy. This is fusion done right. 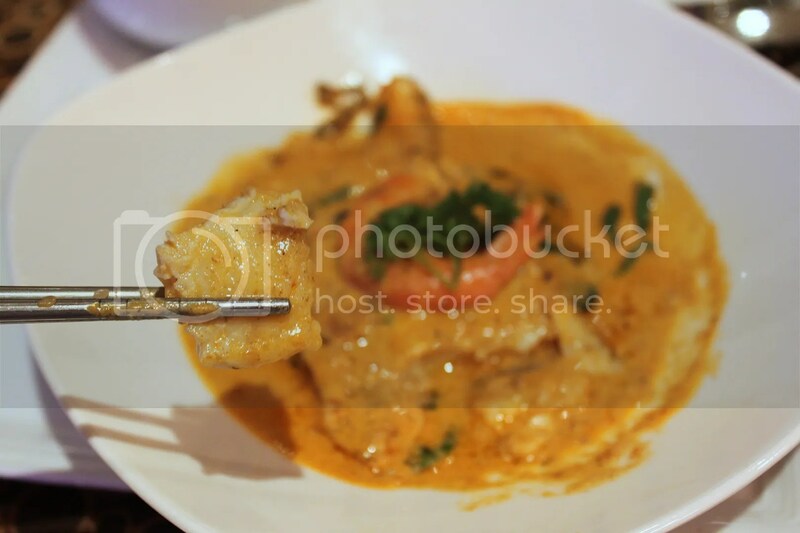 The Laksa prepared at their live cooking station falls short when compared to the cod dish. The gravy is a tad too spicy and not as smooth as what you can get from the reputable hawker like Katong Laksa. 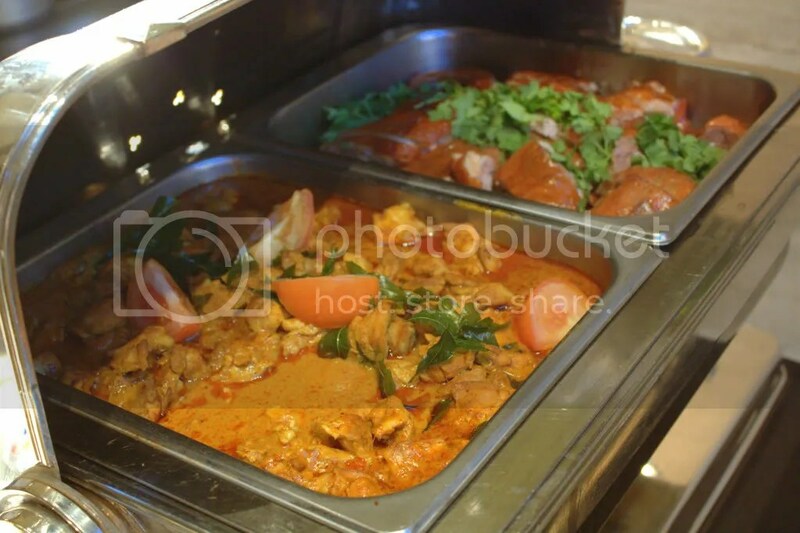 The buffet line also features a vast array of other international and local dishes. Other dishes that I found palatable were the Fried Kuey Teow which had a nice “wok hei” character and the Curry Mutton. 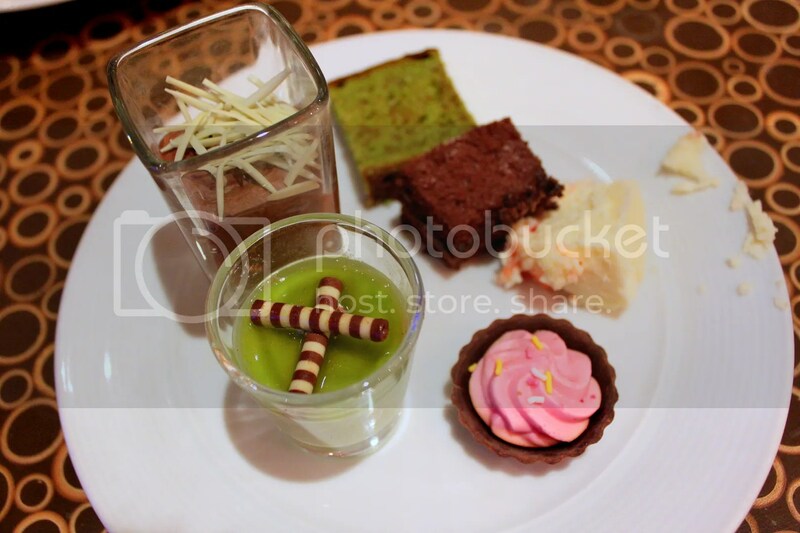 As for desserts, the Chocolate Mousse with Mint Chocolate (left of bottom pic) is clearly unrivaled. It is so darn good and chocolatey that it was the only dessert I took that I left none for the ants. 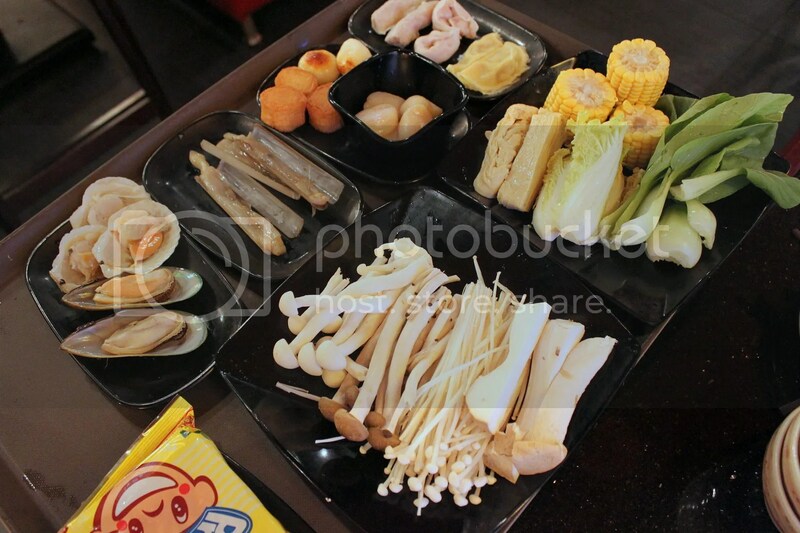 Seriously, save stomach space for at least 2 of this, or maybe 3 because it’s the star of the buffet. I would even come back specifically for this if it was served ala-carte. 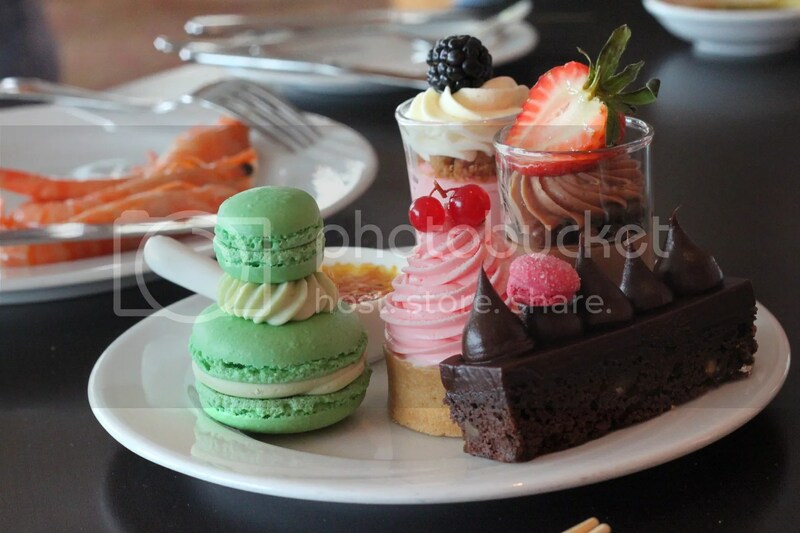 The Green Tea Panna Cotta (bottom left of bottom pic) is not bad as well. Overall, I would say that the buffet is priced at fair value. 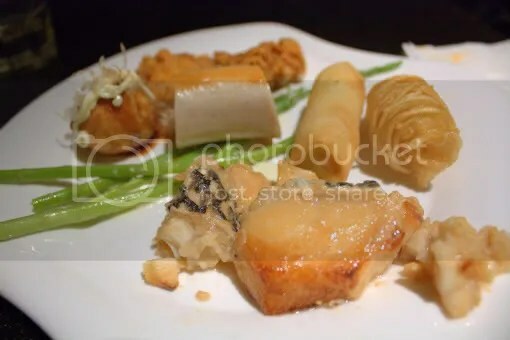 The selection and quality might not be as good as some of the more renowned buffet restaurants in Singapore, justifying the more affordable buffet prices at The Square but there are definitely a few gems here that are waiting to be discovered. Coupled with the current What’s the Big Deal promotion, it might just be worth dropping by. 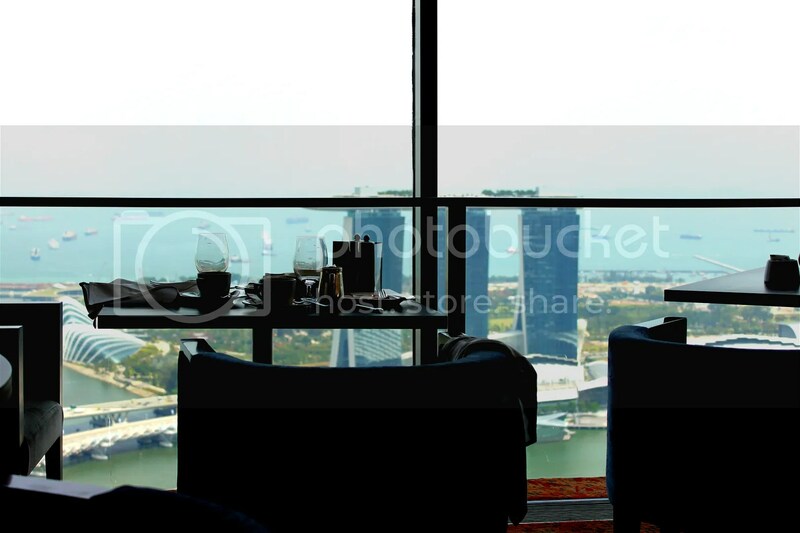 On a random note, guests who stay in the “executive rooms” of Novotel Clarke Quay also get access to their premier lounge, where they get complimentary food and booze (wine included), plus a great view (bottom) from the private balconies in the lounge. I believe the executive rooms are around $60/night more expensive than the standard rooms, so I think its quite a good deal to just upgrade since you get a larger room and I’m pretty sure most of us can guzzle $60 worth of booze a night easily. Special thanks to Novotel and John for hosting an enjoyable evening. The last time I visited Shin Yuu was 2 years back. 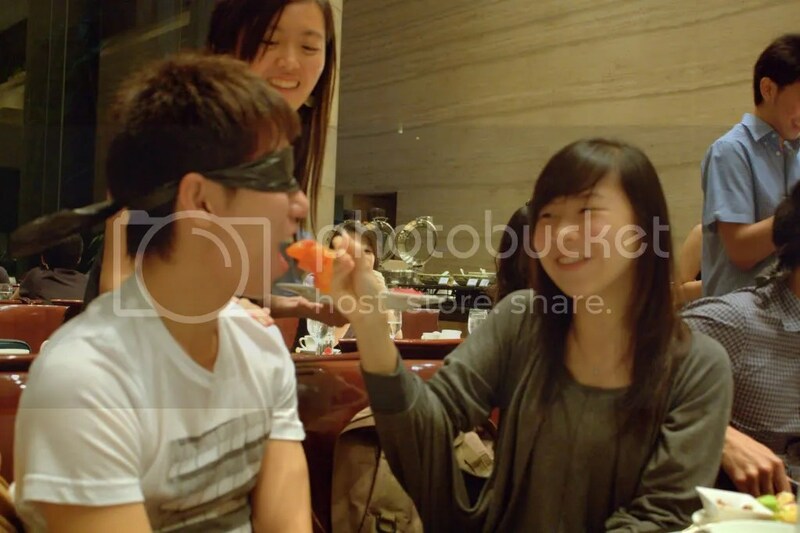 In my view at that time, it was one of the best ala-carte Japanese Buffets around for its price range of about $50. I knew of some friends who loved it so much that they visited it on three consecutive weeks after discovering it. My lastest visit though, confirmed rumours that standards have since fallen. 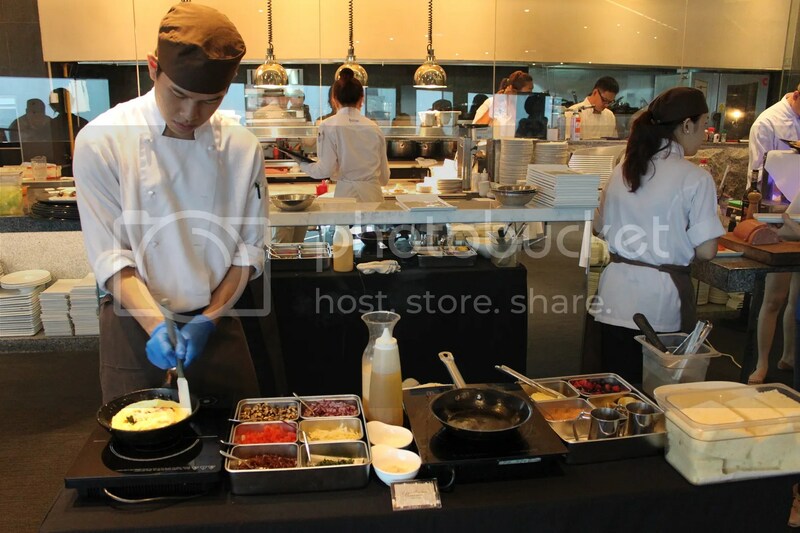 However, I wouldn’t consider it a wasted trip since this was a SMU Gourmet Club event and I only paid $20 for the lunch buffet, the remainder being subsidized by school/club funds. 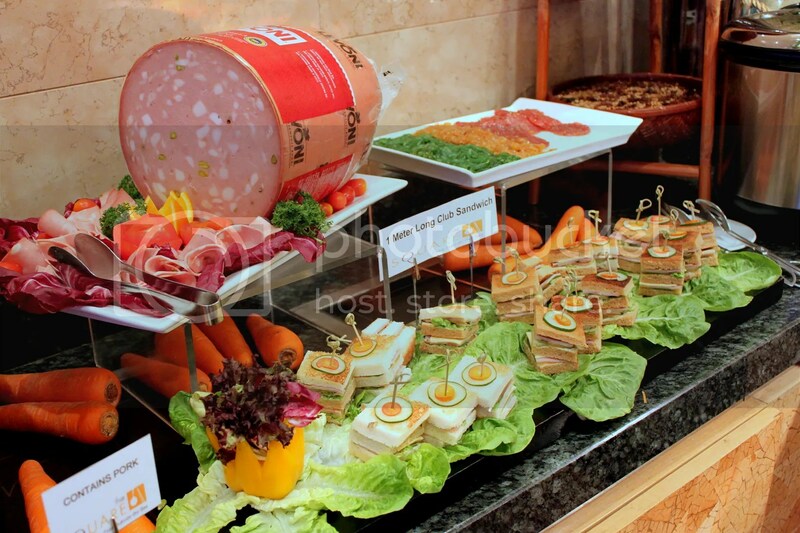 The usual price for Lunch Buffet is $36.90++, while Dinner Buffet is priced at $49.90++. 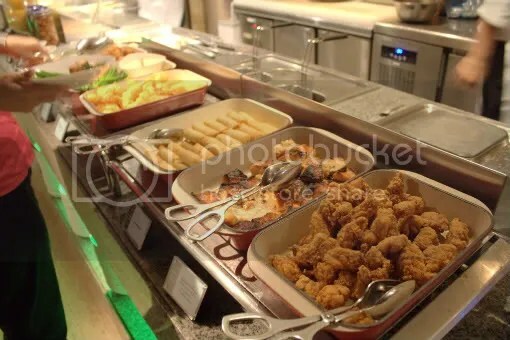 The buffet menu is essentially the same for lunch and dinner and the only difference would be the one-time only (premium) orders that are served at the start of the meal. Personally, I’m not really the buffet sort. 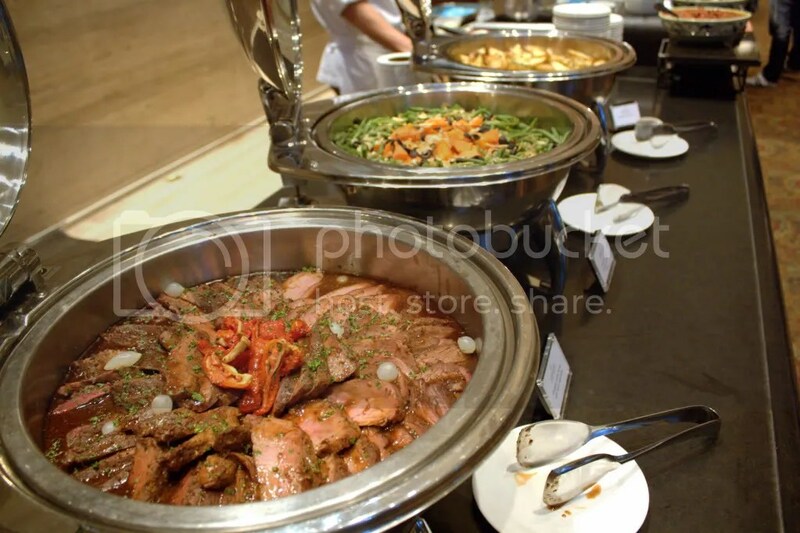 I hate having to sieve through mounds and mounds of dishes just to find a few semi-decent ones, not to mention most non ala-carte buffets have their dishes being left out for god knows how long, compromising on quality and freshness. 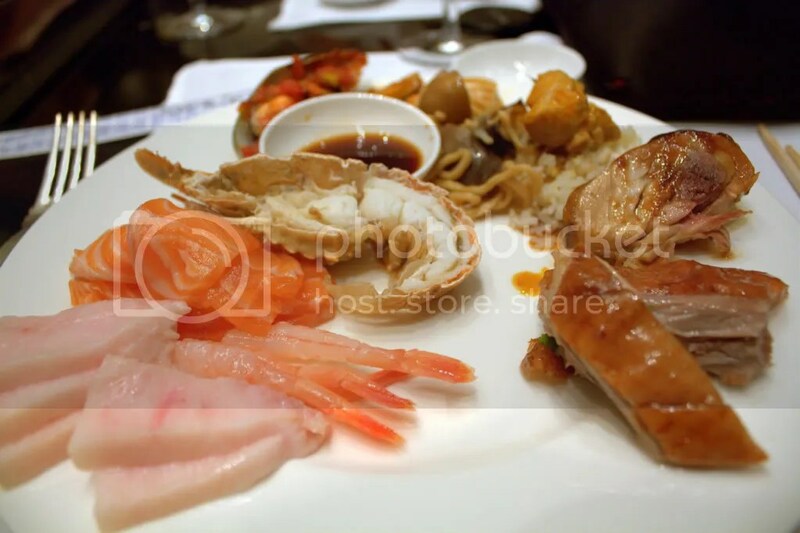 Fortunately for us, such problems wasn’t faced at Shin Yuu since it’s an ala-carte buffet and dishes are freshly prepared upon order. We first had a one-time only order of Seared Minced Tuna Belly Sushi and Smoked Duck (seen in background). 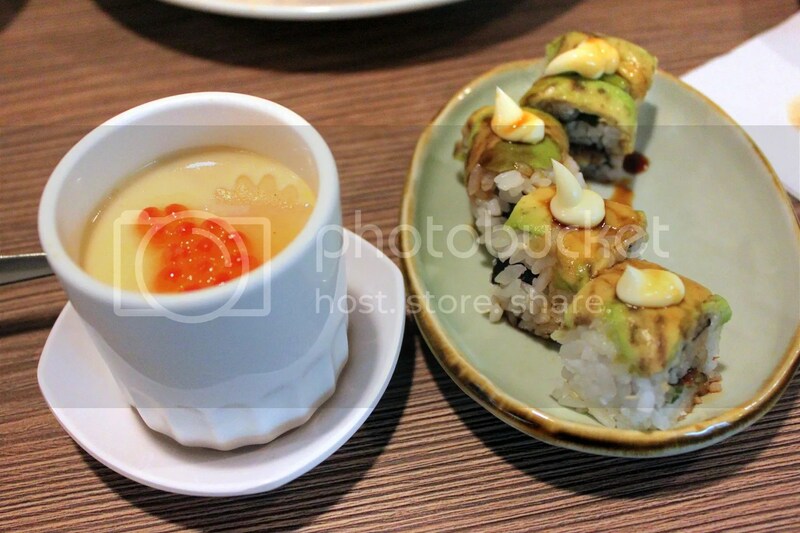 The tuna sushi is pretty good and I would have ordered seconds if it wasn’t a premium item, but don’t go expecting to taste much of the tuna belly though as the savoury sauce more or less conceals its taste. 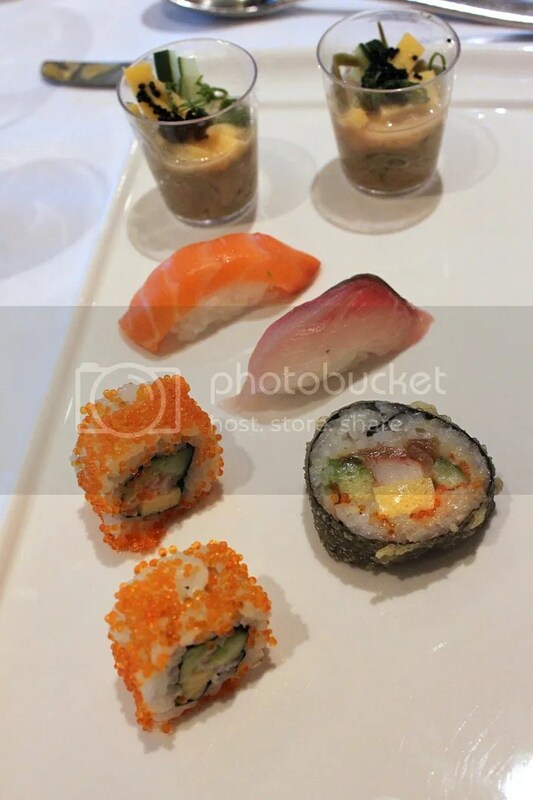 The Shin Yuu Special Aburi Special (in foreground, multiple orders allowed) is in essence a seared salmon sushi coated with a layer of mentaiko sauce. This combination works and I had multiple orders. 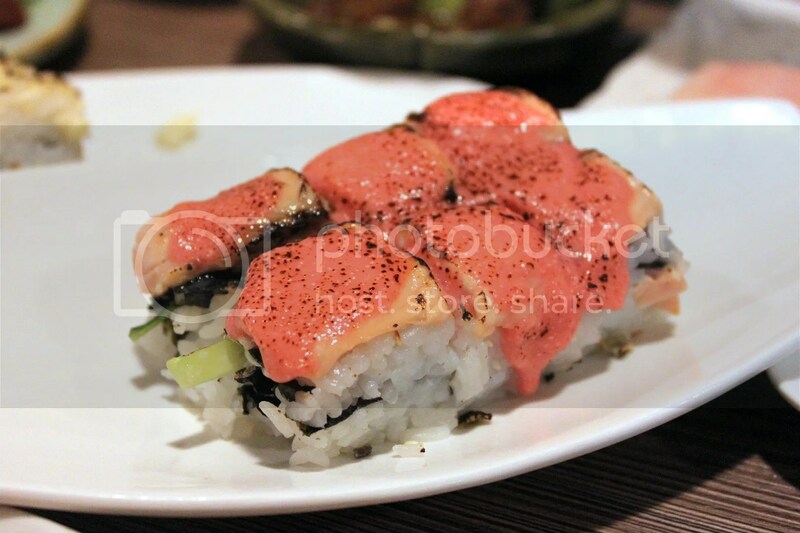 I have to say the minced tuna sushi and salmon aburi sushis are probably my Shin Yuu favourites. Just a meme that I made to complement this post. We know this is too true. 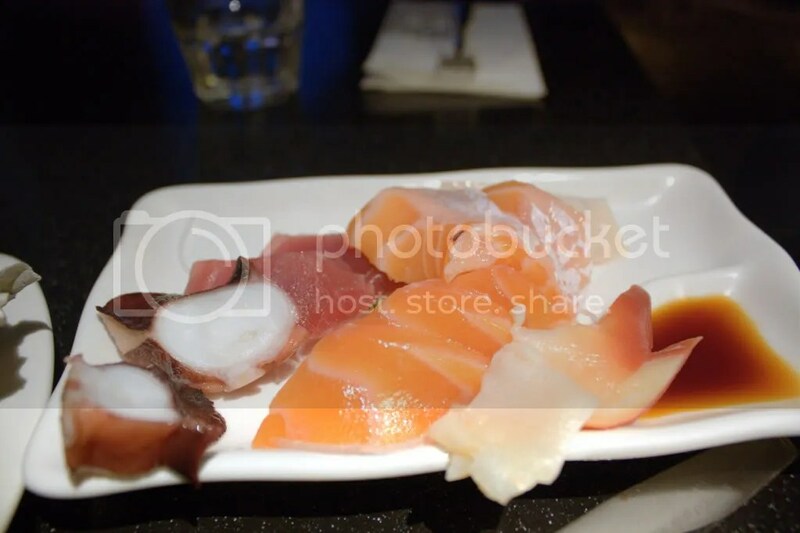 The Sashimi Moriawase aka Mixed Sashimi Platter included slices of Salmon, Tuna, Swordfish, Kingfish and Octopus Sashimi. 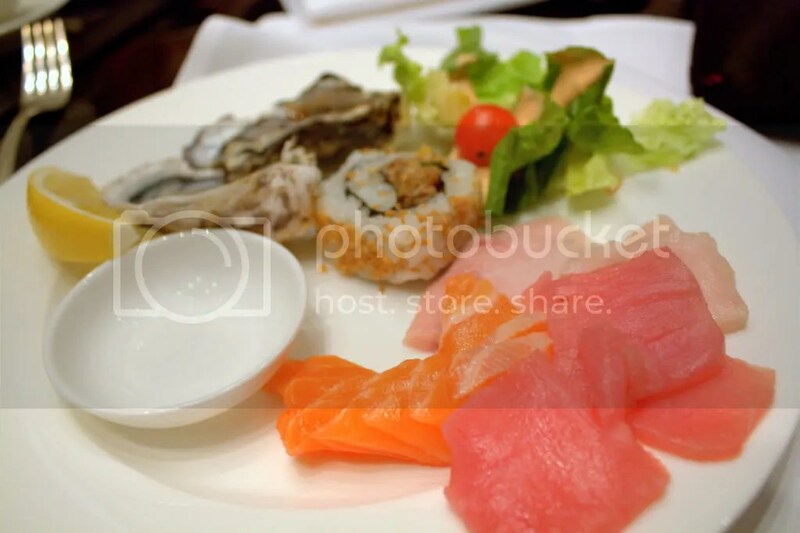 The sashimi tasted rather muted and barely thawed (especially the swordfish), but this is to be expected of buffet standards. 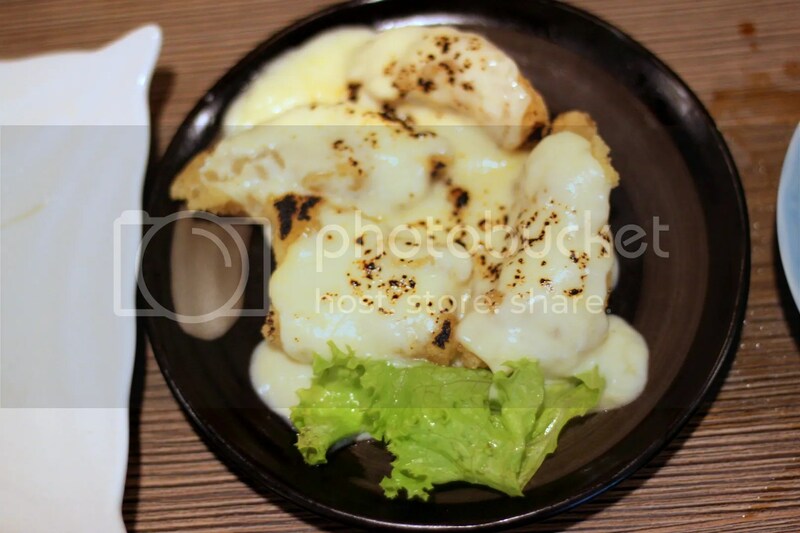 Had I not been so full already, I would have probably enjoyed the Shin Yuu Special Sakana Chiizu (“Dory Fish topped with Cheese”) a whole lot more. I had a few rich dishes and by the time I reached this dish, the excessive cheese coating came across as much too cloying. The dory is fried well though with a nice light crispy batter. 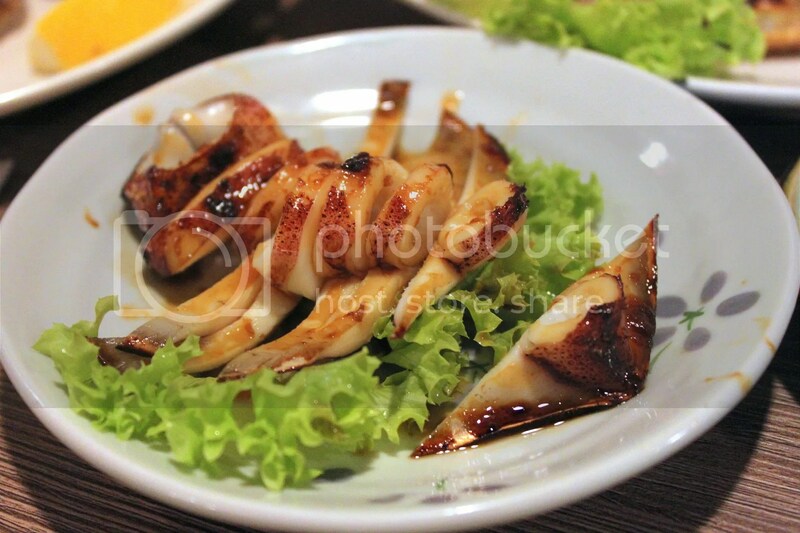 The Ika Sugatayaki (“Squid with Sweet Soy Sauce”) suffered a case of over-grilling, such that it became too tough to chew in some areas. You can probably skip this. While friend C commented that the Buta Misoyaki (Pork Loin with Miso Sauce) had an overly porky taste, I thought it was fine as the thick miso sauce helped to mask the gamey scent she had mentioned. I’m a sucker for fatty pork dishes anyways. One of the better dishes from Shin Yuu, I found the Hotate Mentaiyaki (Grilled Scallops with Cod Roe Sauce) pretty fresh, with the scallops having a nice springy texture. 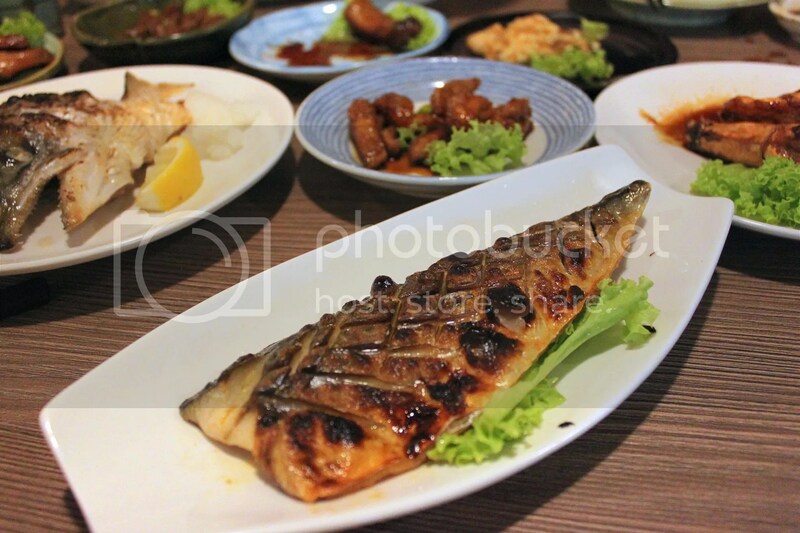 The Saba Shioyaki (Mackerel with Salt) comes across as very average to me, probably not much different from what you can get at a nice Japanese food court stall. 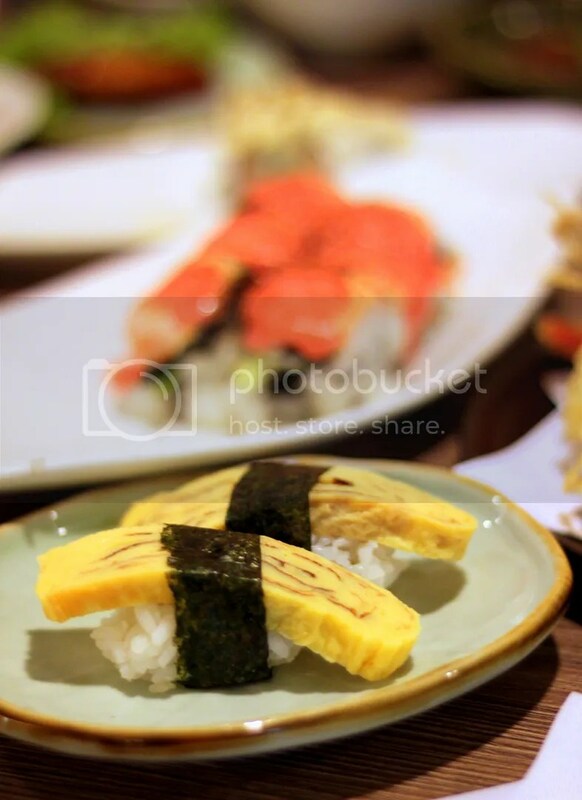 The one at Kaiho Sushi, ah that’s one to be remembered. 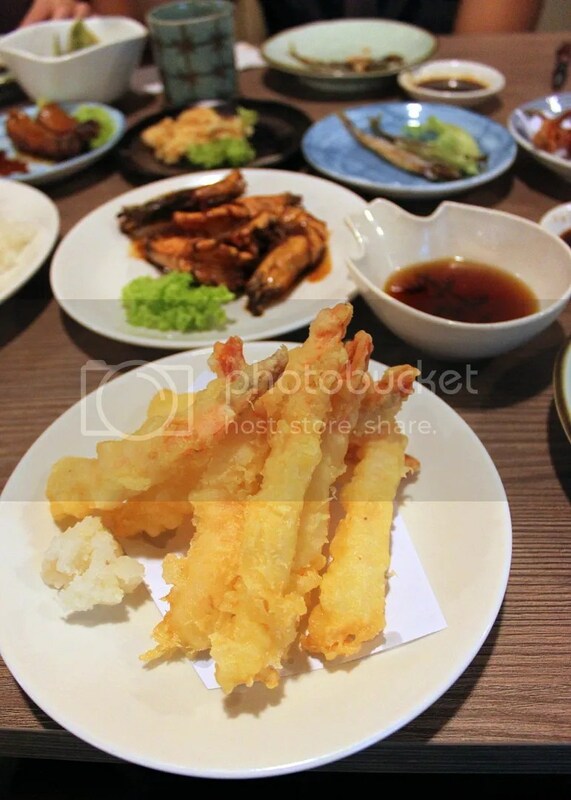 The Ebi Tempura is something worth ordering too. The prawns aren’t as sweet as I would have liked but it’s fried nicely, with the batter remaining crisp for a noticeably lengthy period when it was left on my table. The Shin Yuu Special Ebi Miso Mayo Yaki (“Prawns with Miso and Mayonnaise Sauce”, left of picture) is one of my favourite items on the menu. It arrives looking like an orh lua (oyster omelette) with a slight outer crisp of fried cheesy mayo that is really yummy. 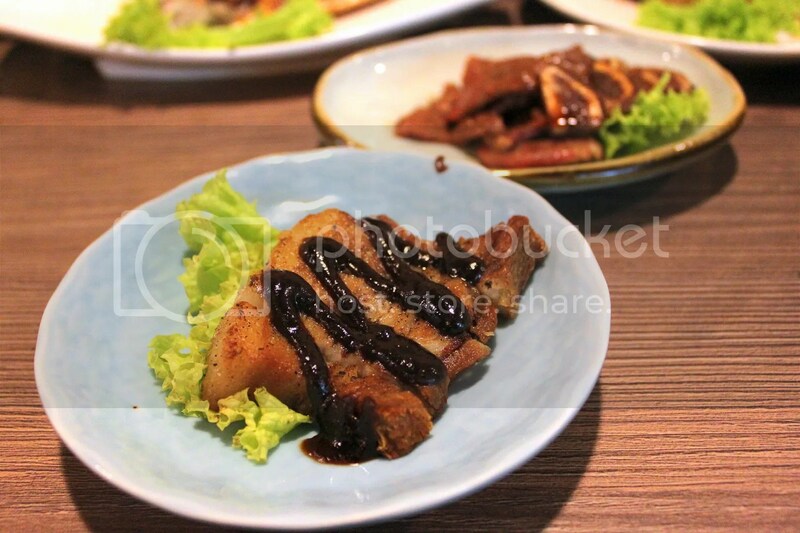 On the other hand, the Tebasaki (“Grilled Chicken Wing”) is glazed in a sweet sauce and proves to be simple comfort food. 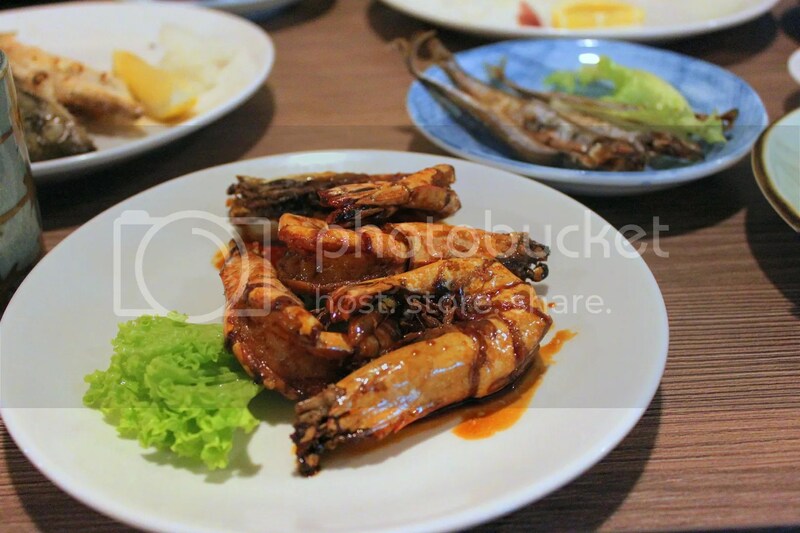 The most disappointing dish today was the Kuruma Ebi Teriyaki (“Tiger Prawn with Sweet Soy Sauce”). The prawns had a fishy odour, so much so that I left it untouched after a small nibble. 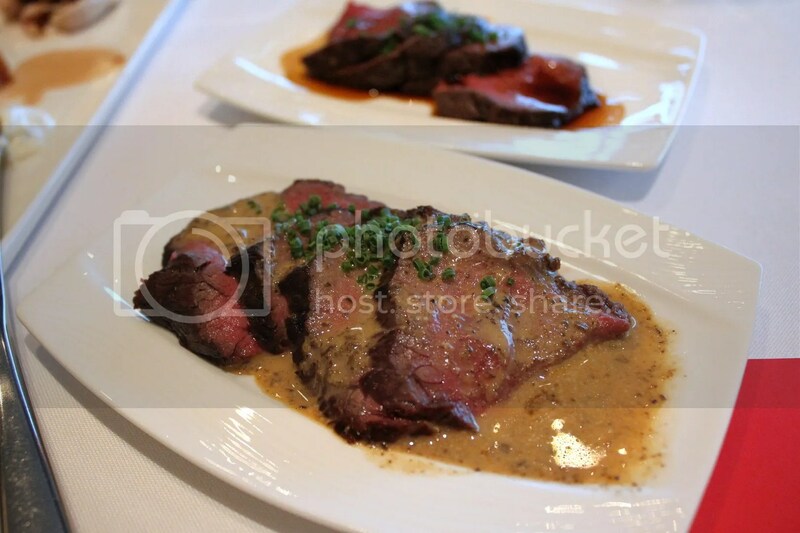 The Wafu Tenderloin Steak (left) is forgettable as well. The beef isn’t marbled, nor is the sauce remarkable enough to warrant an extra order. 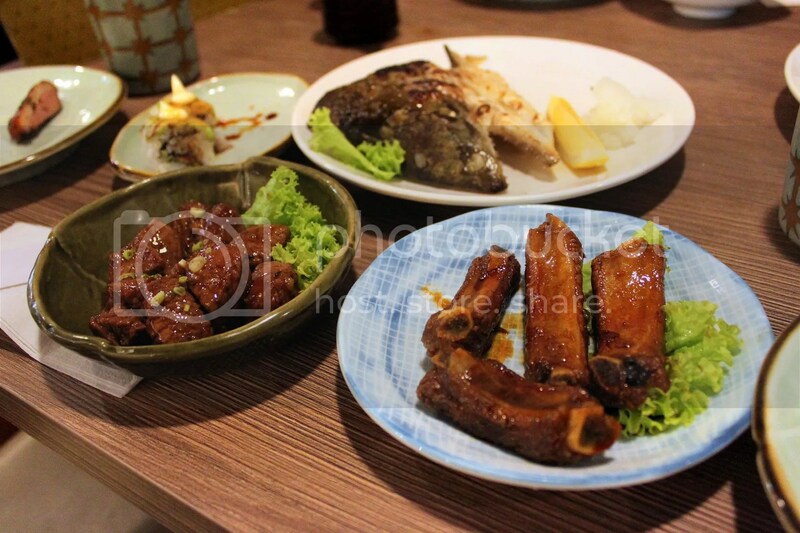 I liked the Spare Ribs Teriyaki (right) though, the pork is well marinated, tender and falls off the bone easily. 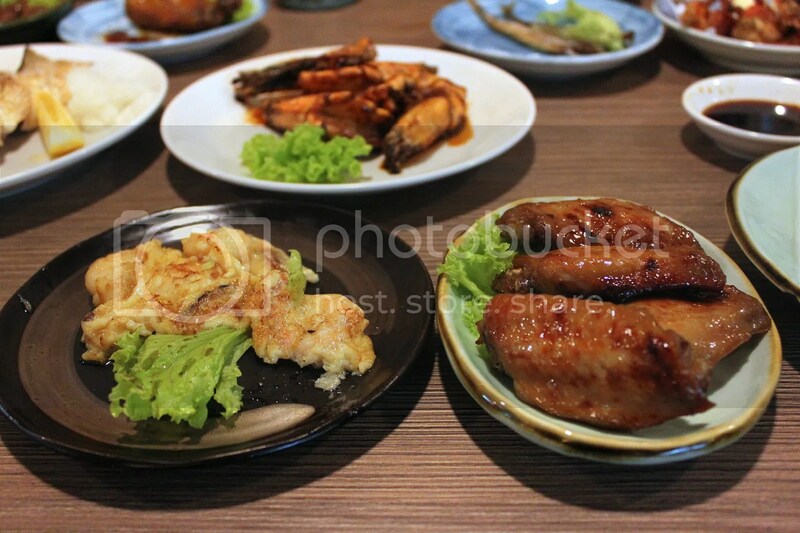 As for the Grilled Salmon Head (background), you can just give it a miss as well. 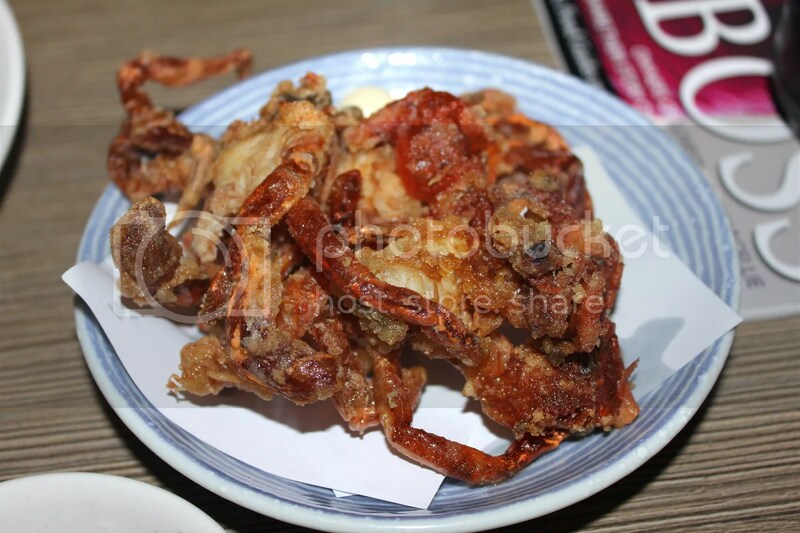 I really love Kani Karaage (Deep Fried Soft Shell Crab) but the ones here lack flavour. 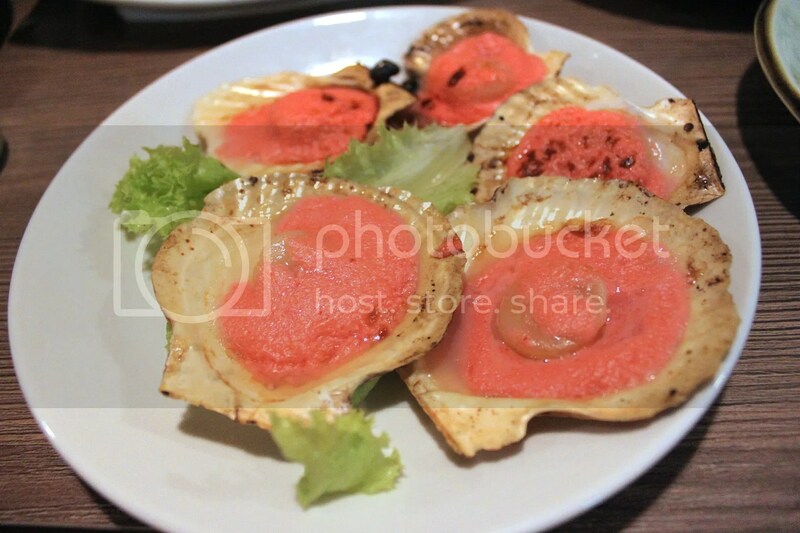 The crabs lack its natural sweetness and I tasted more batter than crab. 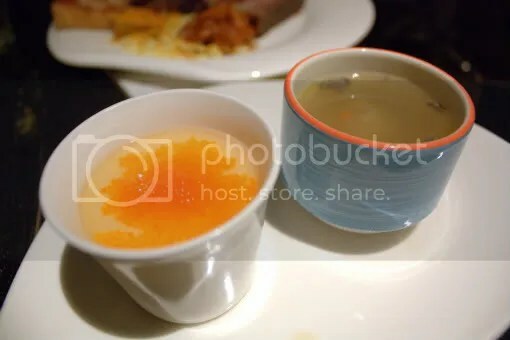 The Shin Yuu Speicial Chawanmushi with Salmon Roe is competently done here, exceeding expectations. The egg is light and smooth, lacking any discernable air bubbles. The Shin Yuu Special Makimono (“Unagi with Avocado Sushi”) would have been better if they were more generous with the eel. One of my grouses here was that the sushi tends to have less ingredients and more rice as lunch progresses on. All in all, compared to the time I last visited 2 years ago, I’m now finding it hard to think of a good reason to come back and at the lunch price of around $45, I’d rather settle for a simple lunch set at reputable Japanese restaurants elsewhere. 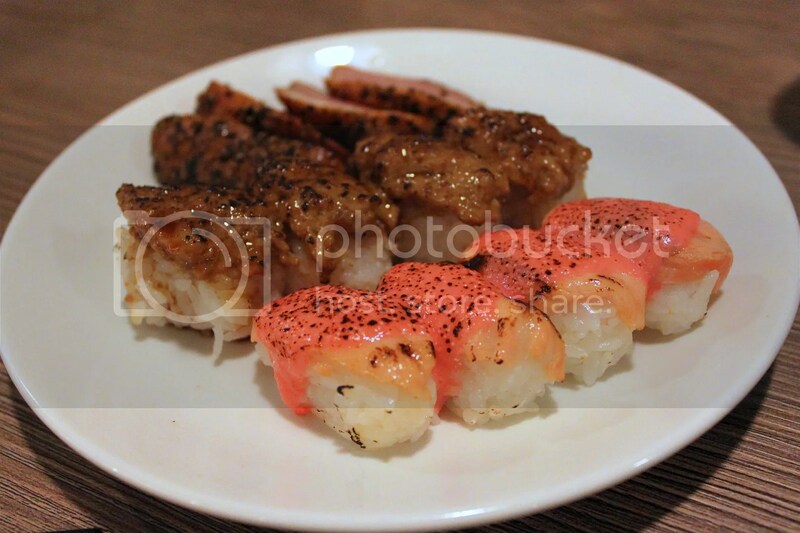 For buffet lovers however, it might possibly be worthwhile to drop by Shin Yuu if you are around the area. The Dining Room does away with appetizers that simply clutter up the buffet line and focuses mainly on the Raw and chilled Seafood. Can’t say that most Singaporeans would be happy with this allocation of resources. My first plate of sashimi was a little fishy but on seeing the old tray being replaced, I scrambled to the buffet line once more and found the sashimi much better this time. My first time having seen shrimp sashimi at a local buffet and I thought it was pretty decent, relatively better than Sushi Tei’s. Wasn’t terribly impressed by the variety of the heated food section, thought I thought the Roast Duck was not bad as the skin was still slightly crispy. There’s live cooking stations for pasta, and a carving station as well. 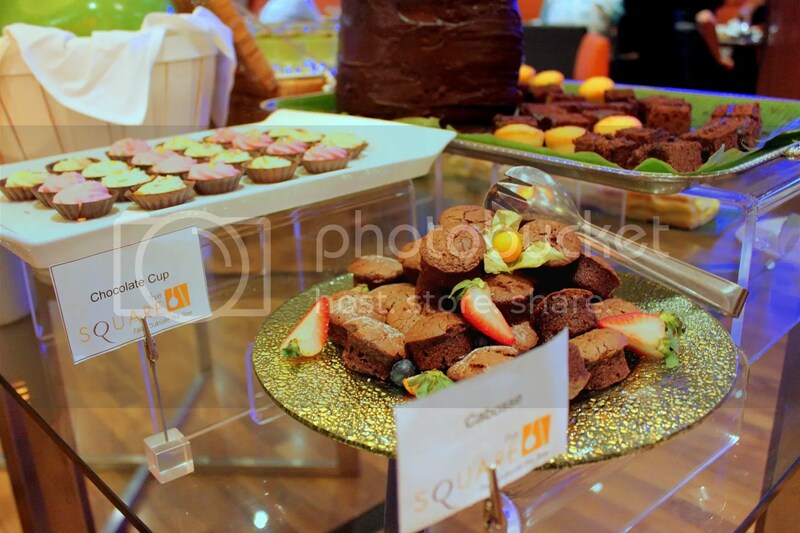 My favourite part of this buffet was the Desserts! 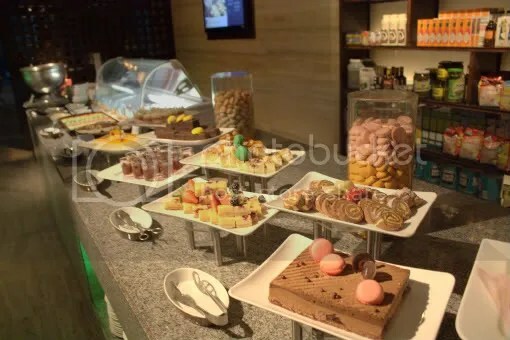 Awesome Chocolate Praline with Crunchy Layer and other assorted cakes, not so commonly seen tray of Chocolate Praline (white, dark and orange chocs), Durian Pengat (raved by my friends though I didn’t try), Ice Cream Station and a live Waffle Station with over 10 types of toppings ranging from the usual Chocolate Sauce, Vanilla Sauce, Maple Syrup to the unusual Aloe Vera and Sea Coconut. Overall, service was very attentive and my plates were swiftly cleared as soon as I put down my cutlery. 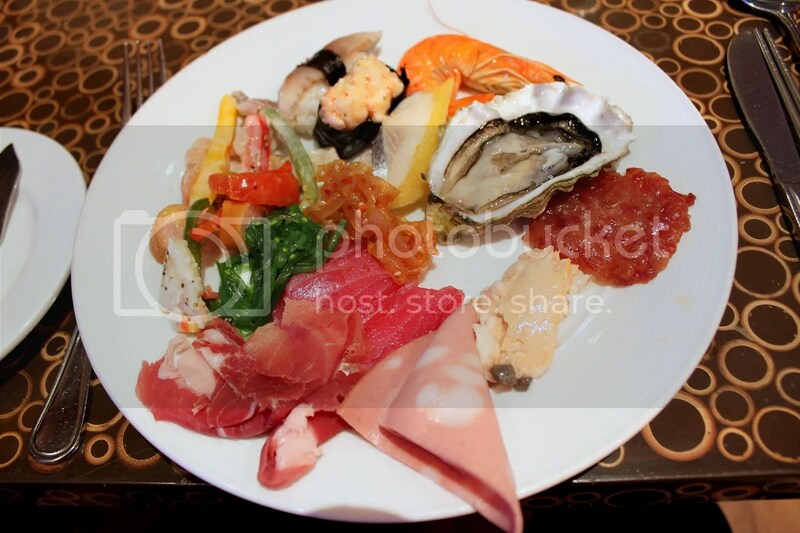 Buffet items were refilled frequently as well for which I’m very grateful, especially since sashimi turns stale rather quickly. 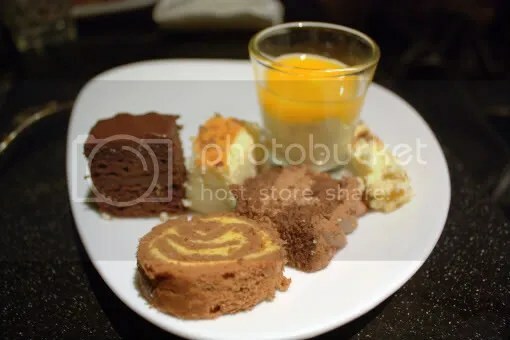 While the range of the buffet items was not as extensive as The Line or Triple Three, I felt that the dishes were above average for a buffet, especially the Shrimp Sashimi which is rarely seen in buffets, the Chocolate Praline with Crunchy Layer, Walnut Cheesecake and the Waffles which were prepared ala minute. Towards the end of the meal, we also participated in some games organised by the SMU Gourmet Club which added spice to an already fun-filled night. It’s a pity that we weren’t able to have a glimpse of the lush outdoor greenery and waterfall, which is a salient feature of The Dining Room in the day but I guess I’m more than content with the good food and company. 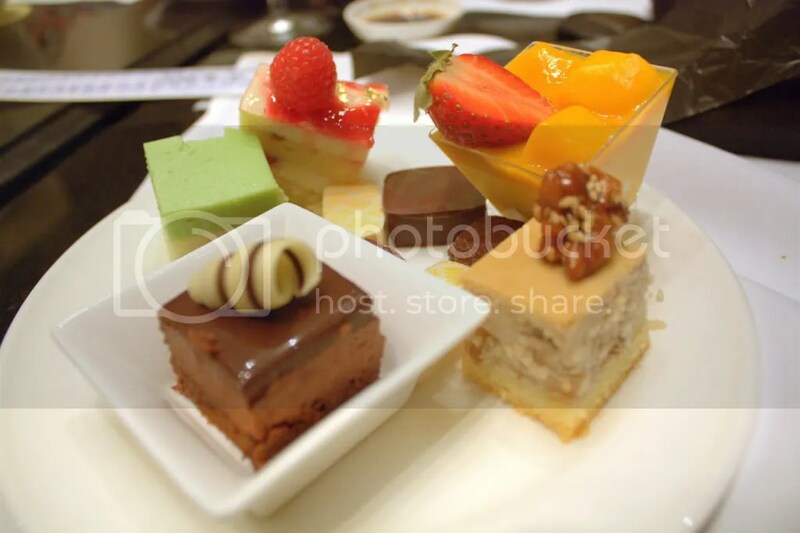 Categories : All YumYums in my TumTum, Buffet, Cuisine Type YumYums, International, Location of YumYum, Novena / Newton, Yummy! 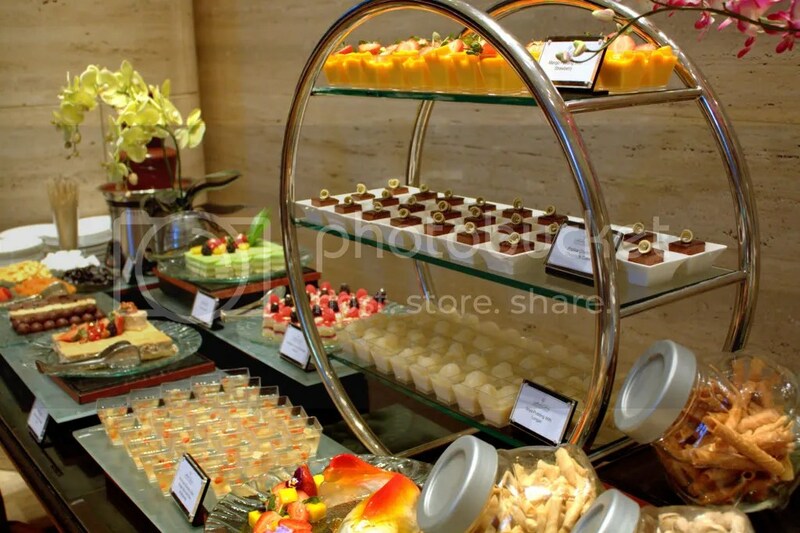 Triple 3 – $88 Weekday Buffet Dinner, Auspicious or just plain Ostentatious? I usually get comments from friends that SMU girls are hotter and prettier than girls from NUS and NTU, and on hearing this I always give them the same reply, “With quantity comes quality”. With only around 900 female students per cohort in SMU in contrast to the respective 3500 and 4000 female students per cohort in NTU and NUS, I believe that by the sheer overwhelming absolute numbers, there definitely has to be more chio bus in NUS and NTU, albeit much spread out over the large campus so you don’t get to see them as much as in SMU. Well does this analogy of “with quantity comes quality” apply to buffets as well? Personally, I don’t think so. 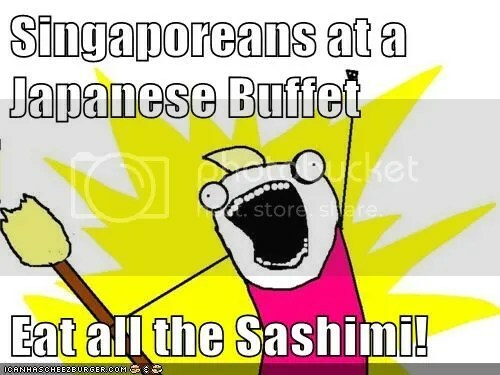 I’m no fan of buffets and I’m perplexed as to why it has grown so popular in Singapore. 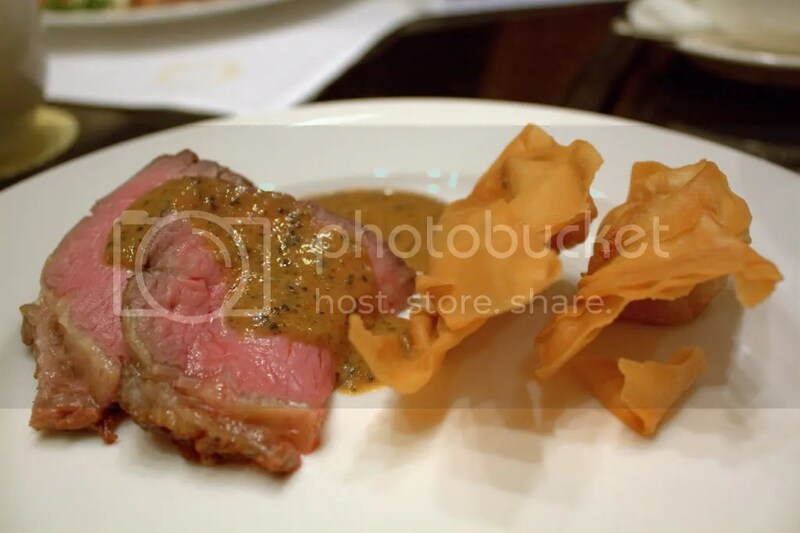 Perhaps it’s due to our multi-racial and multi-cultural society where we like to pinch a bit of Indian here and there, nibble on some Chinese and move on to sample Japanese and European cuisines. 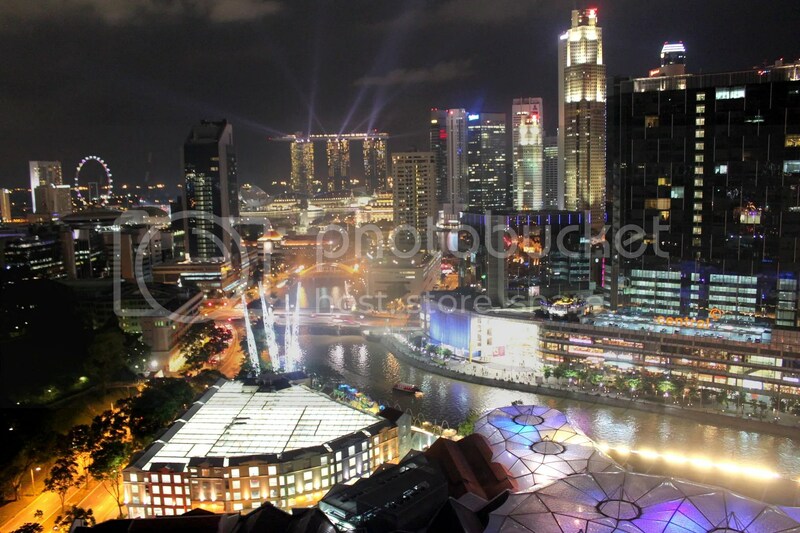 After all, we Singaporeans pride ourselves as a global people, don’t we? 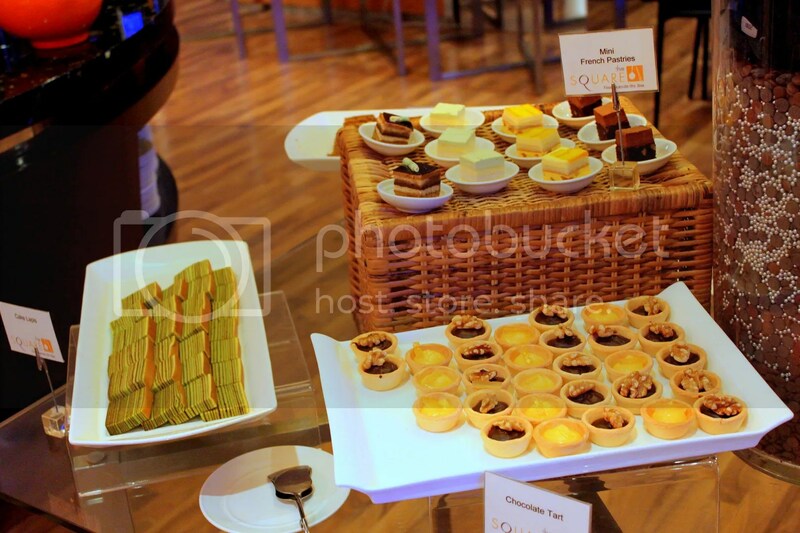 Still, I don’t see how buffet quality food justifies the hefty pricetag that comes along with it. 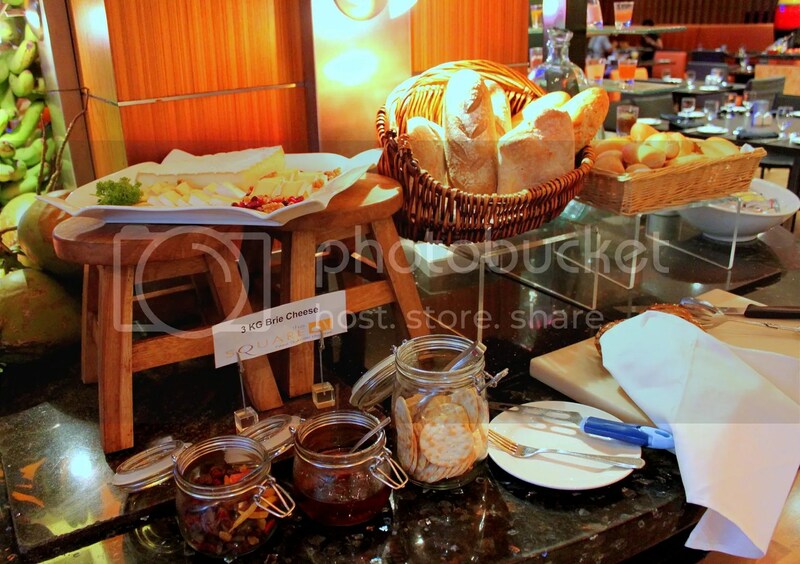 That’s where Triple’s 3’s 1-for-1 buffet deal comes in (for DBS Cardholders which lasts till 28 Feb 2011). 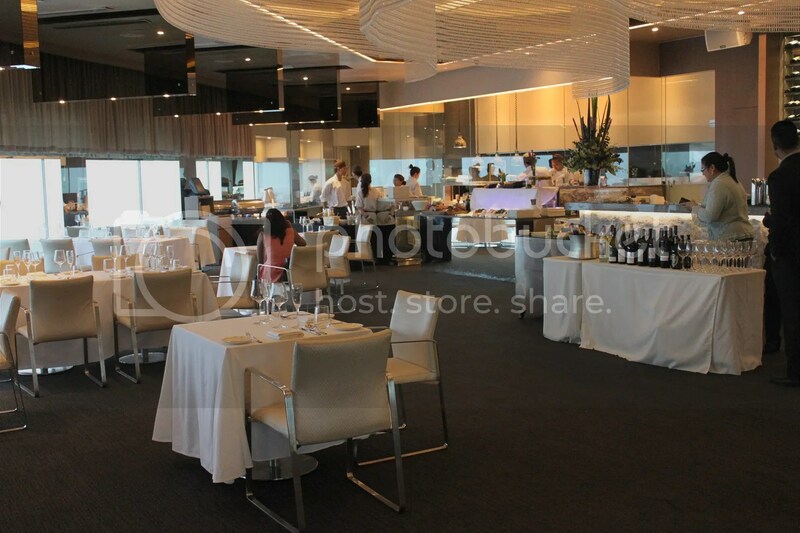 (Citibank has a separate promotion where 1 dines for free for every 3 paying adults for Sunday Brunch). 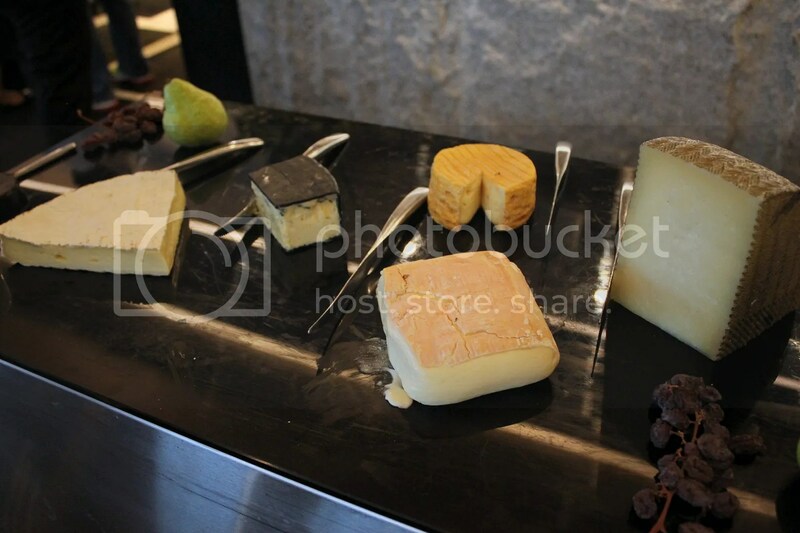 Triple 3 has been touted as one of Singapore’s more extensive and pricy buffets, going for $88++/pax for weekday dinners. 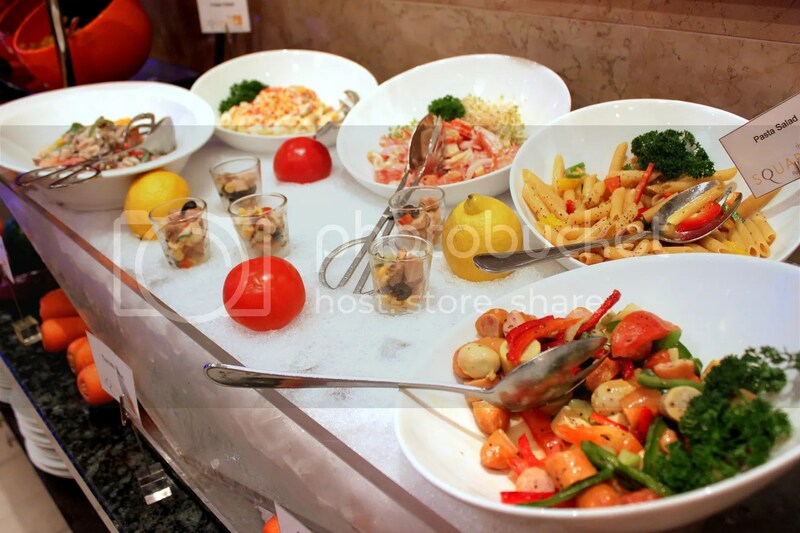 The buffet starts with the usual Salad and Seafood Bar. 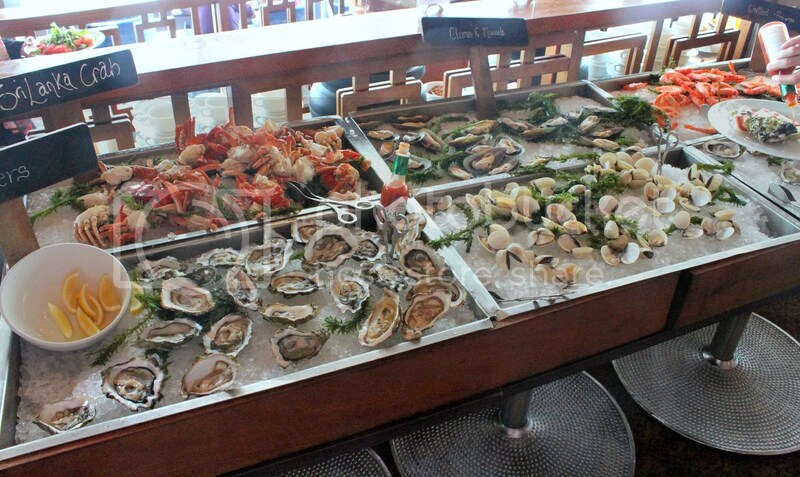 Not a bad selection of seafood, ranging from raw oysters, scallops, clams, mussels, hokkaido crab legs and chilled prawns, all of which were adequately fresh. Next up, the Sashimi Bar. 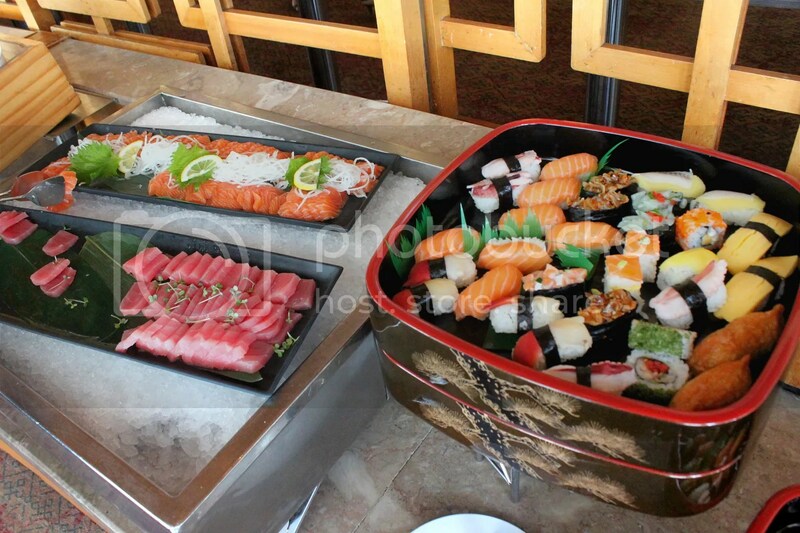 More than usual buffet variety with Salmon, Salmon Belly, Tuna, Swordfish, Octopus and a type of Clam. There’s also a section for nibblers. Japanese Fried Chicken and Chilean Seabass are just such crowd pleasers. There’s also a station for Roast Duck and Soba, as well as a Grill station. 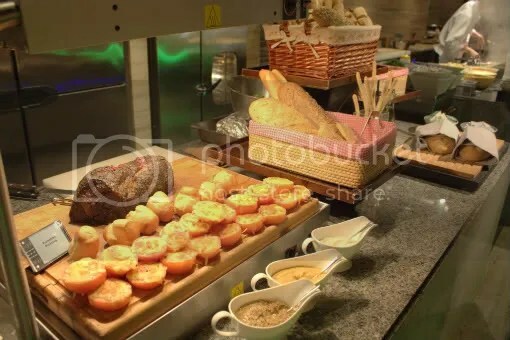 I really loved the beef, probably the most enjoyable roast beef I have had in a buffet. 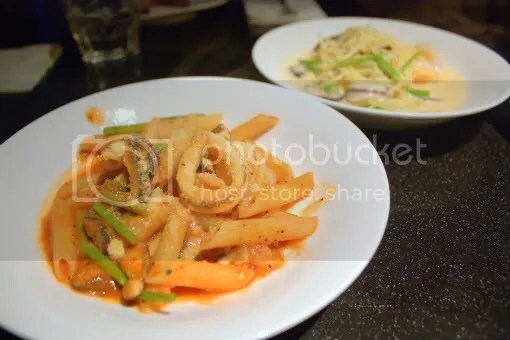 For the pasta station, the Tomato-based pasta is worth mention while the cream Cream-based pastas were lackluster and bland. Decent Chawanmushi and an overly salted Black Chicken Soup. 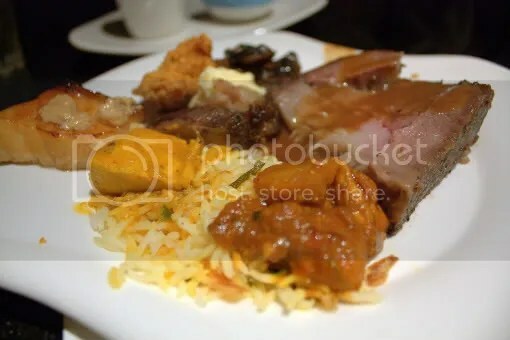 Most of the heated dishes were Indian Cuisine so I decided to give most of them a miss as spice doesn’t do you any favours in a buffet setting, especially when there’s sashimi and other raw seafoods involved. Hokkien Mee was pretty good. 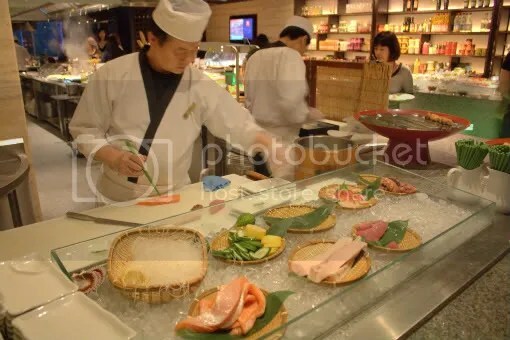 A queue would form at the teppanyaki station whenever the prawns, beef or salmon was about to be done. 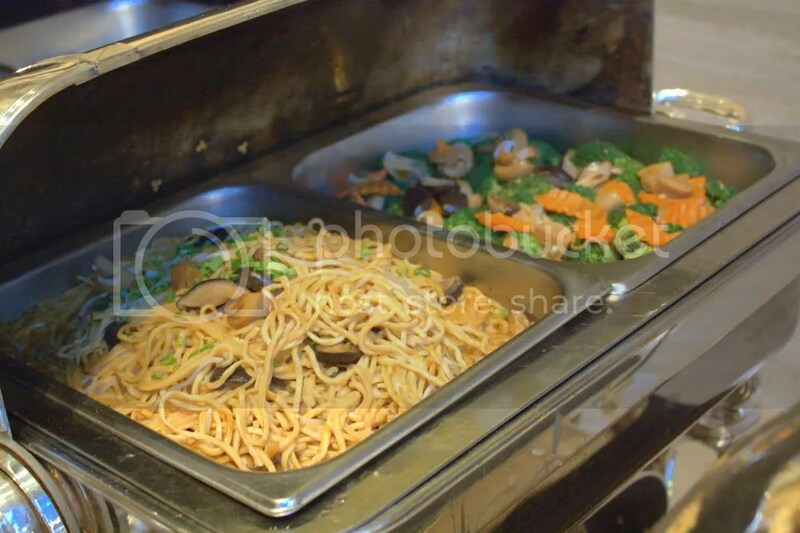 I didn’t think much of these assorted teppanyaki though. Finally it was time for desserts. 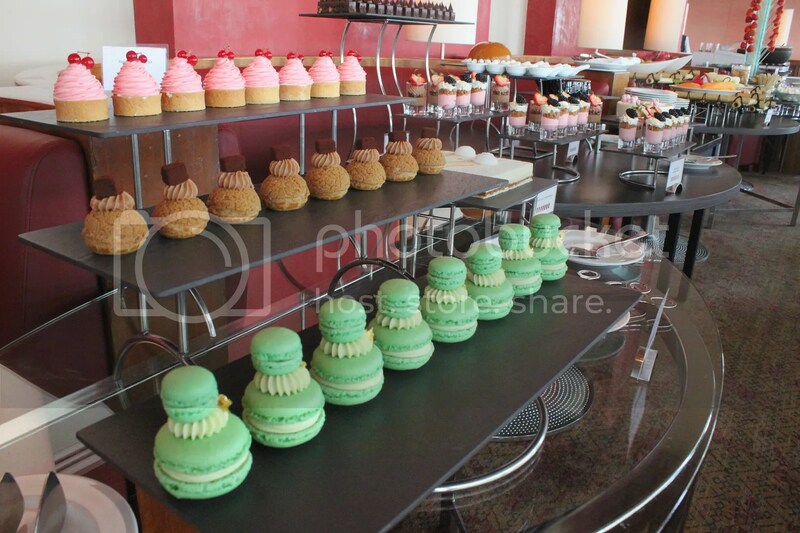 Delightful cakes here and there but nothing good enough to leave a deep impression. I would say Triple 3 offers a pretty good spread and while there’s nothing awesome enough to rave about, most of the food was above average. 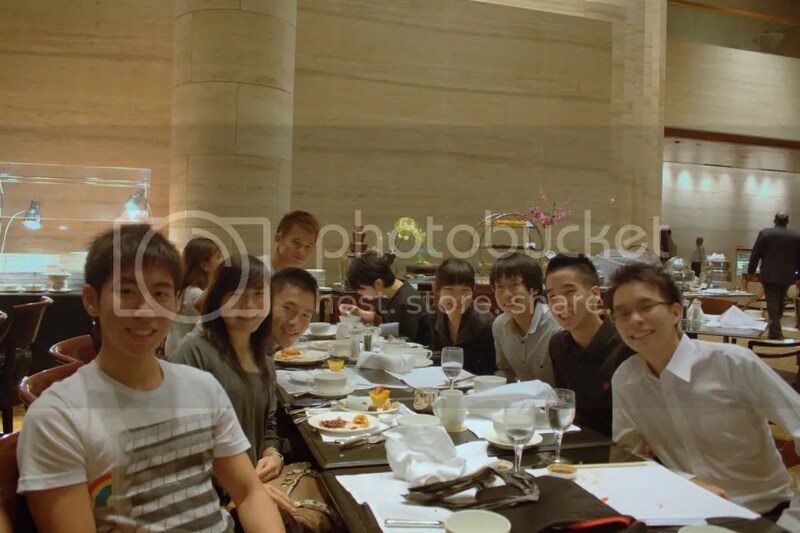 So, if you are a buffet fan, I think Triple 3 deserves a visit, especially with the ongoing 1-for-1 promotion. 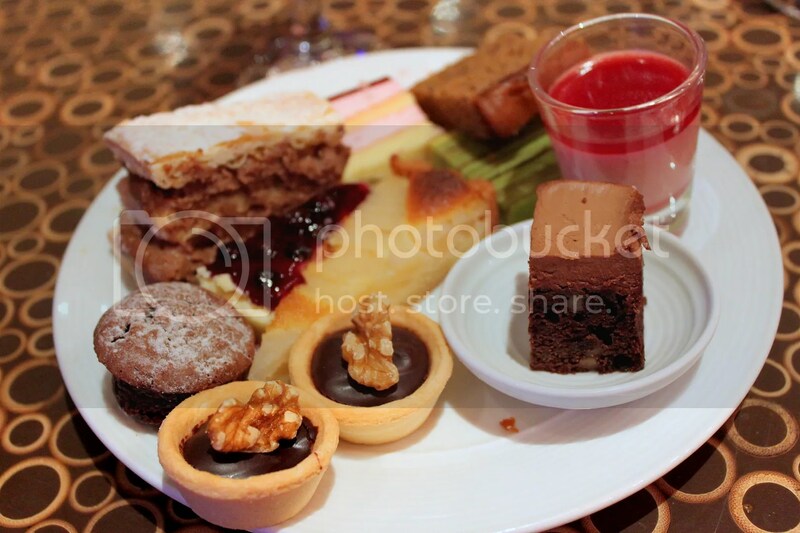 Categories : All YumYums in my TumTum, Buffet, Cuisine Type YumYums, International, Location of YumYum, Orchard, Yummy!